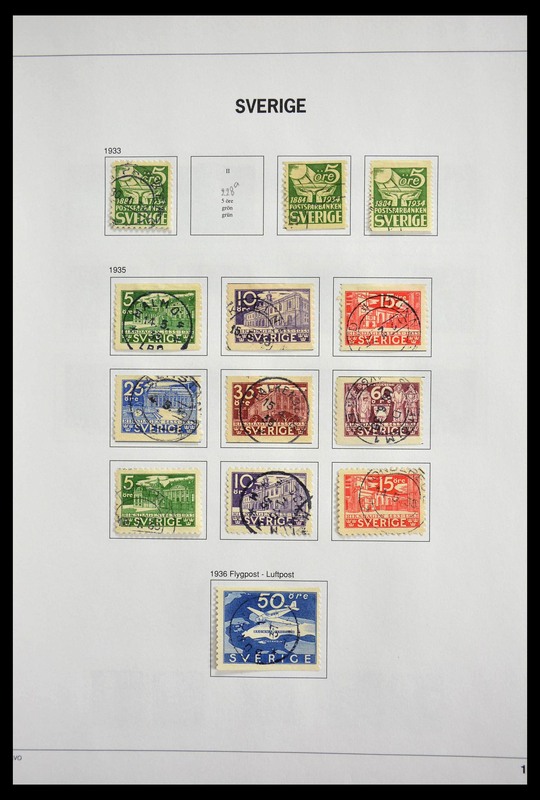 36596 postfrisch (never hinged) ** 700 (100) 1961, Europa, 100 copies of this issue, all mint never hinged. 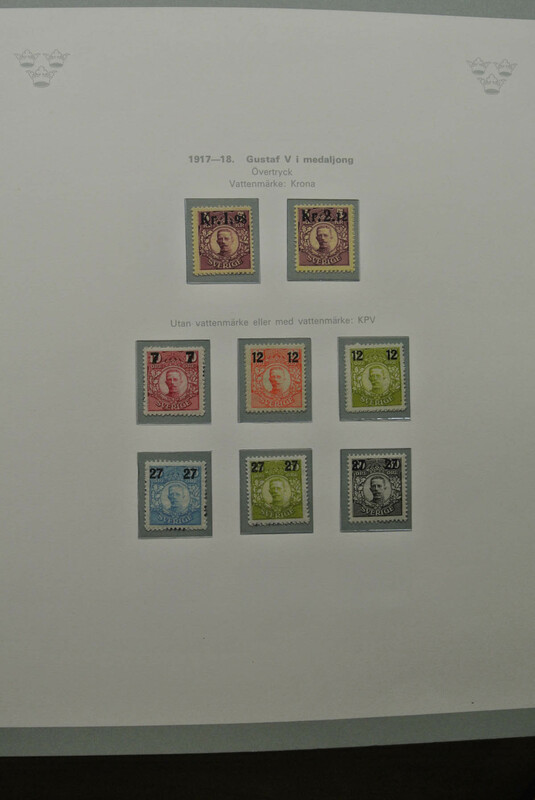 Michel 4000,- €. 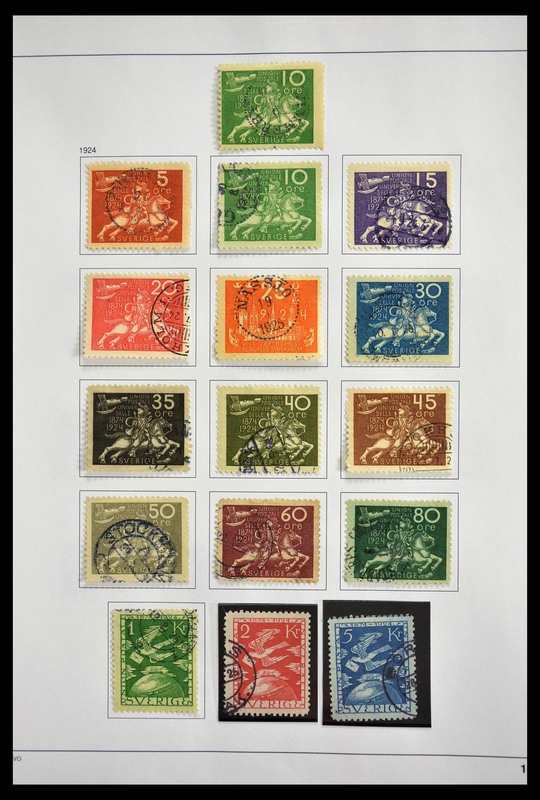 36597 postfrisch (never hinged) ** 700 (100) 1961, Europa, 100 copies of this issue, all mint never hinged. 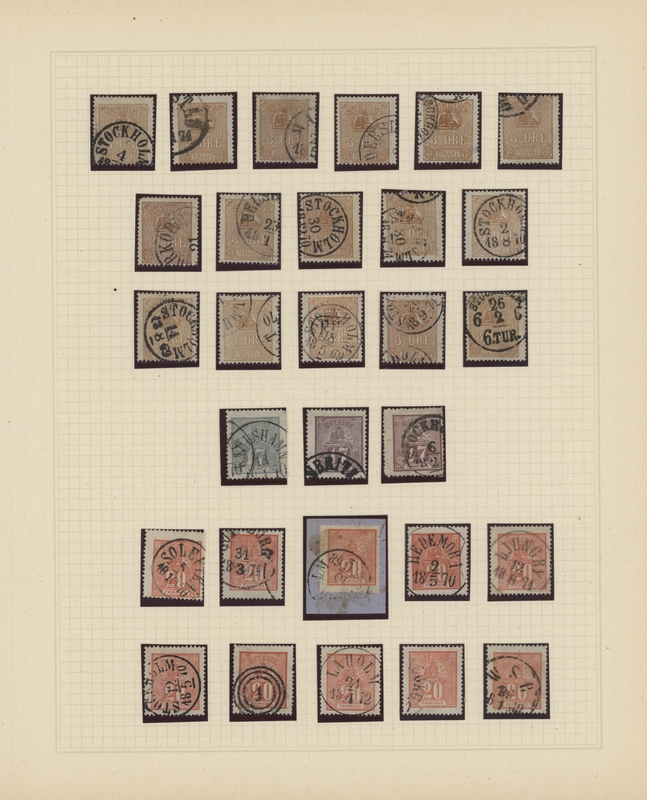 Michel 4000,- €. 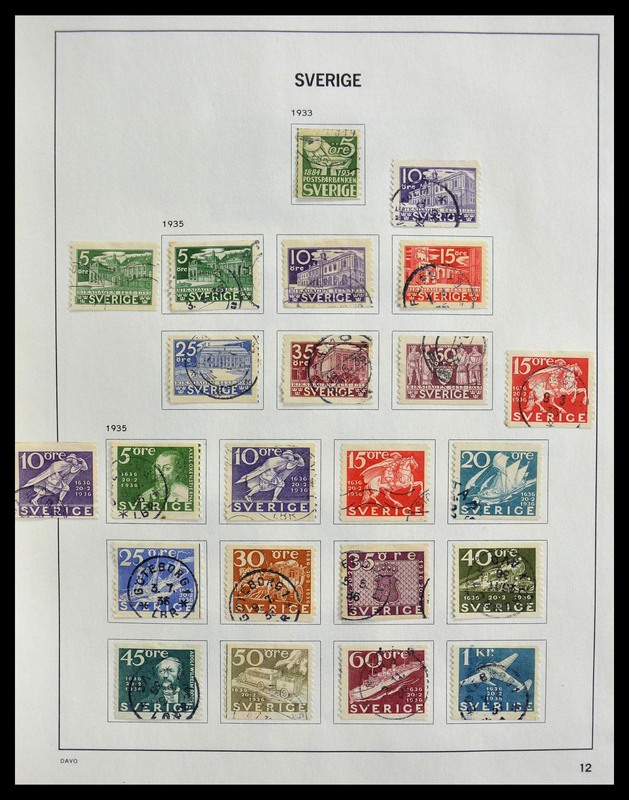 36598 postfrisch (never hinged) ** 1961/1965;1988, stock of the Europa issues, all mint never hinged, in the following amounts: 1961 - 110, 1962 - 1200, 1963 - 1400, 1964 - 680, 1965 - 342, 1988 - 752. 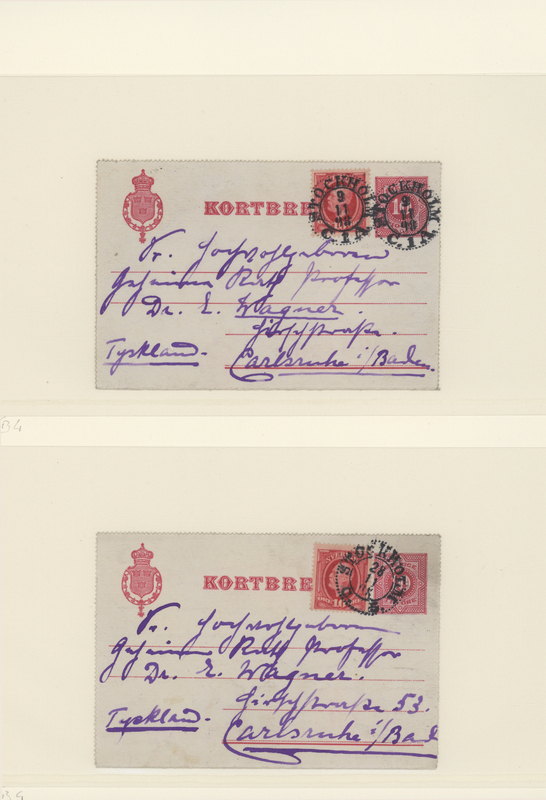 Michel more than 20800,- €. 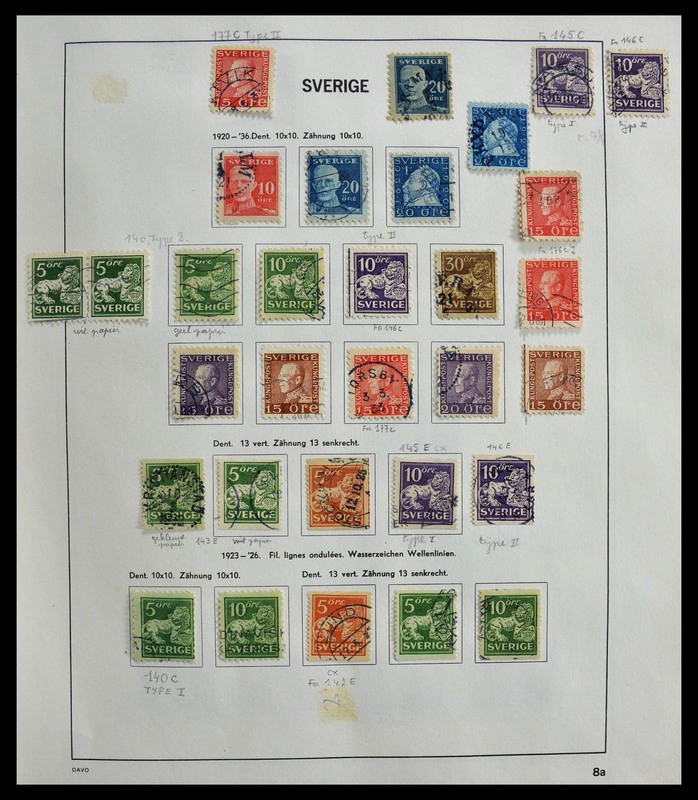 36599 postfrisch (never hinged) ** 1961/1984, stock of the Europa issues, complete sets mint never hinged: 1961 - 400, 1962 - 500, 1963 - 1400, 1964 - 1100, 1965 - 2300, 1966 - 4000, 1967 - 3600, 1970 - 1800, 1971 - 800, 1972 - 900, 1973 - 2000, 1975 - 1500,1976 - 2100, 1977 - 1000, 1978 - 1300, 1982 - 3400, 1983 - 2000, 1984 - 1200. 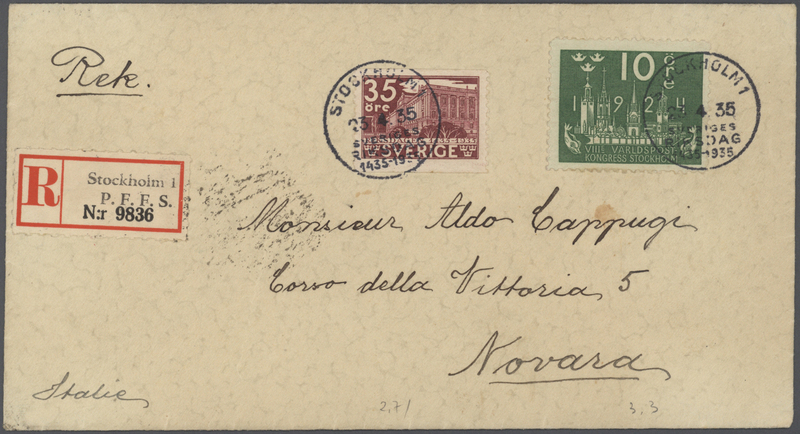 In total ca. 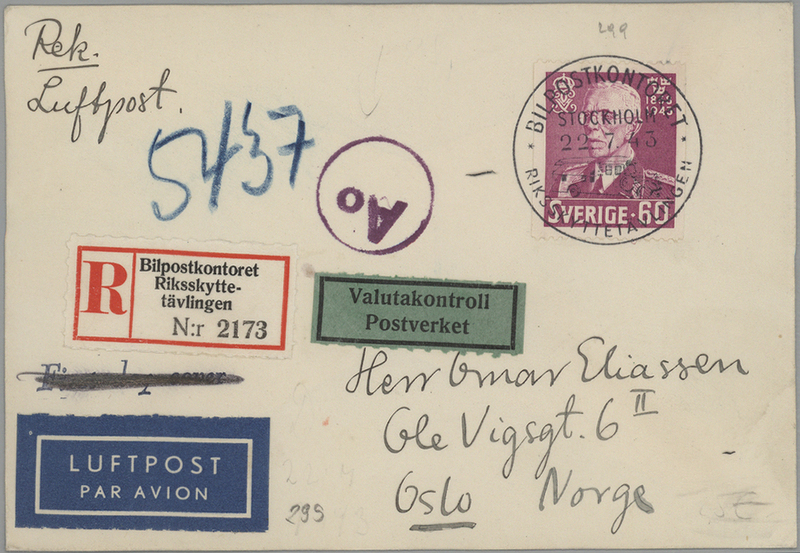 49.000 stamps. 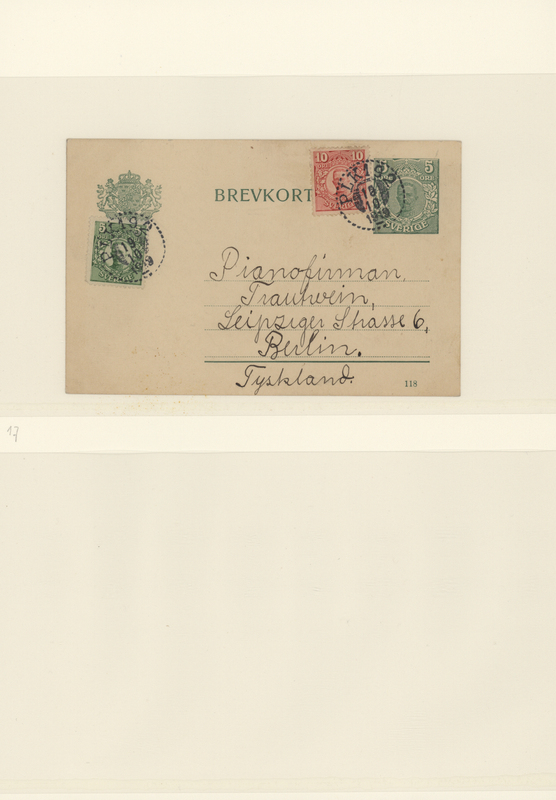 Michel 79.050,- €. 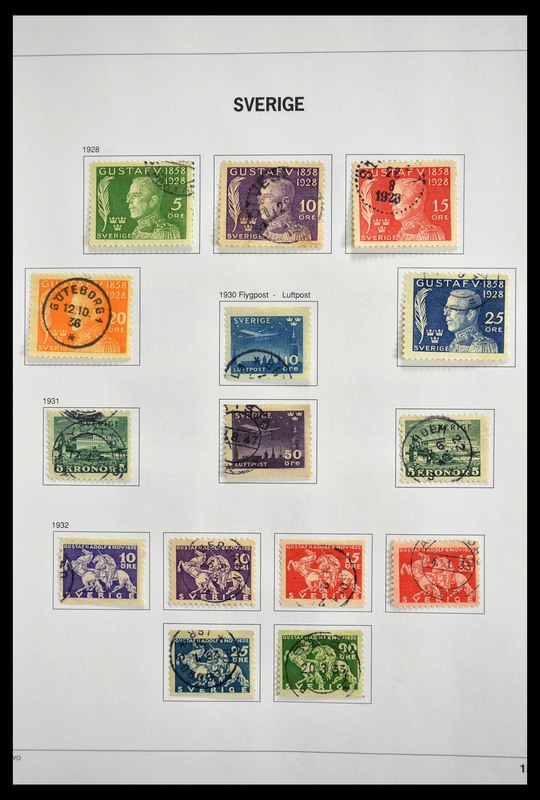 36600 postfrisch (never hinged) ** 1961/1986, stock of the Europa issues, complete sets mint never hinged: 1961 -1000, 1962 - 1200, 1963 - 5500, 1964 - 2100, 1965 - 5000, 1966 - 2000, 1967 - 1400, 1968 - 2300, 1969 - 2300, 1970 - 1000, 1971 - 1400, 1972 - 1000, 1973 - 1000, 1974 - 2600, 1975 - 3600, 1976 - 1200, 1977 - 1500, 1978 - 3000, 1979 - 1800, 1981 - 400, 1984 - 900, 1985 - 200, 1986 - 1600. 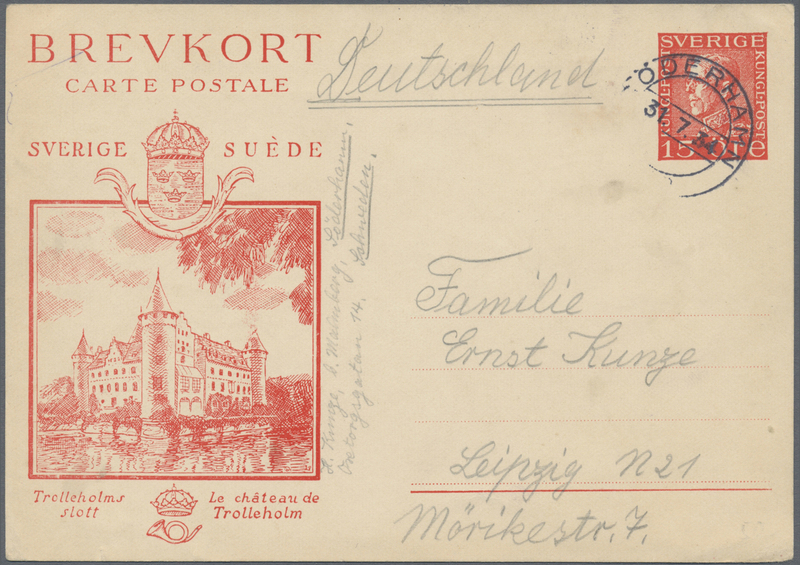 Michel at least 144.030,- €. 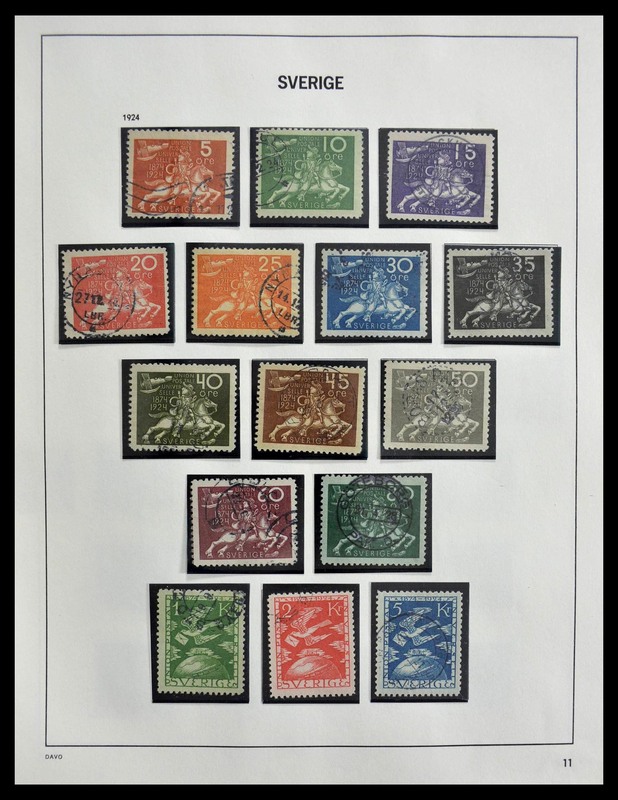 36601 postfrisch (never hinged) ** 1961/1987, huge stock of the Europa issues, always complete sets mint never hinged: 1961 - 600, 1962 - 1100, 1963 - 500, 1964 - 300, 1965 - 1100, 1966 - 2300, 1967 - 1300, 1968 - 500, 1969 - 1900, 1970 - 400, 1971 - 1000, 1973 - 900, 1974 - 1400, 1975 - 3800, 1976 - 500, 1977 - 1000, 1978 - 1800, 1979 - 3000, 198 - 800, 1982 - 1100, 1983 - 300, 1985 - 700, 1987 - 800. 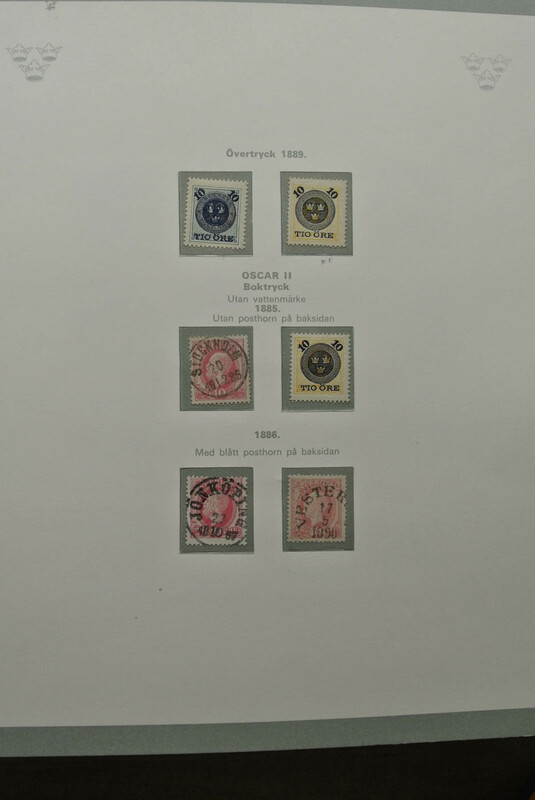 Michel 90580,- €. 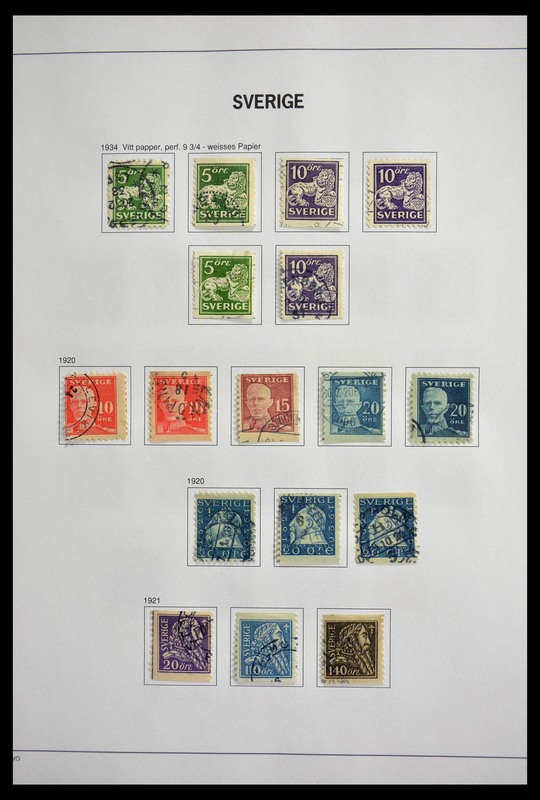 36602 postfrisch (never hinged) ** 1961/1988, huge stock of the Europa issues, always complete sets mint never hinged: 1961 - 1000, 1962 - 1200, 1963 - 1900, 1964 - 1800, 1965 - 2600, 1966 - 2300, 1967 - 2100, 1968 - 2400, 1969 - 900, 1970 - 2400, 1971 - 300, 1972 - 1200, 1973 - 1400, 1974 - 1100, 1975 - 2500, 1980 - 1400, 1981 - 1300, 1984 - 800, 1988 - 400. 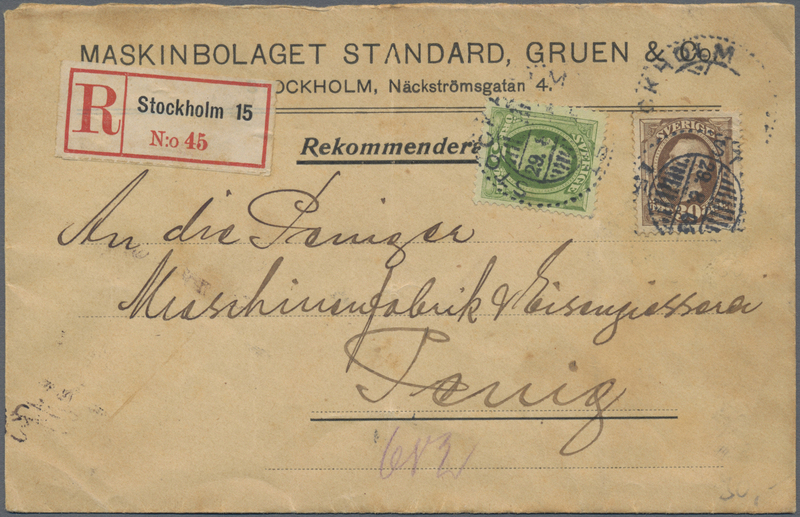 Michel 88680,- €. 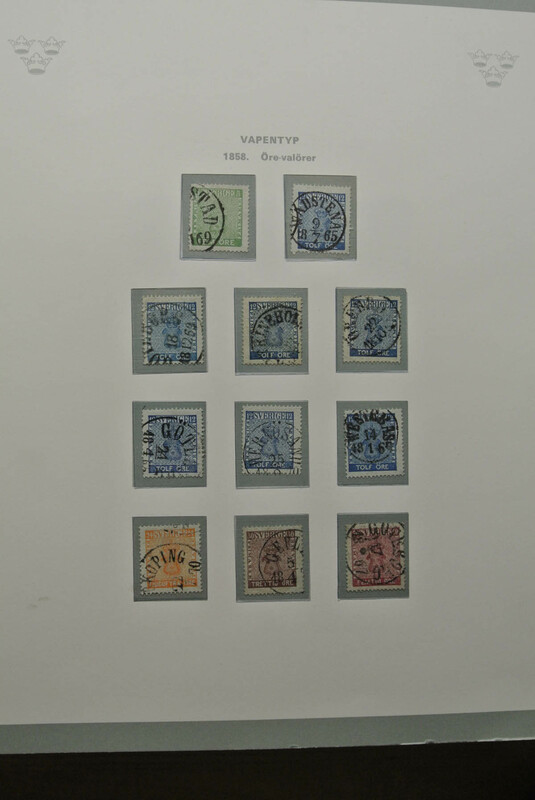 36603 postfrisch (never hinged) ** 1961/1988, huge stock of the Europa issues, always complete sets mint never hinged: 1961 - 1200, 1962 - 400, 1963 - 700, 1964 - 700, 1965 - 1600, 1966 - 1800, 1967 - 1600, 1968 - 1100, 1969 - 600, 1970 - 1300, 1971 - 800, 1973 - 900, 1974 - 500, 1976 - 400, 1977 - 500, 1978 - 1000, 1981 - 400, 1982 - 500, 1983 - 700, 1984 - 300, 1985 - 300, 1989 - 1200, 1990 - 1300. 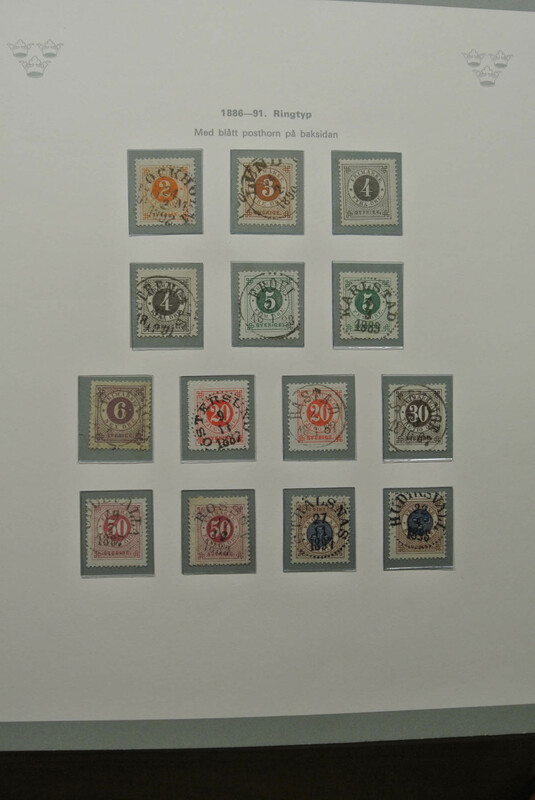 Michel 97280,- €. 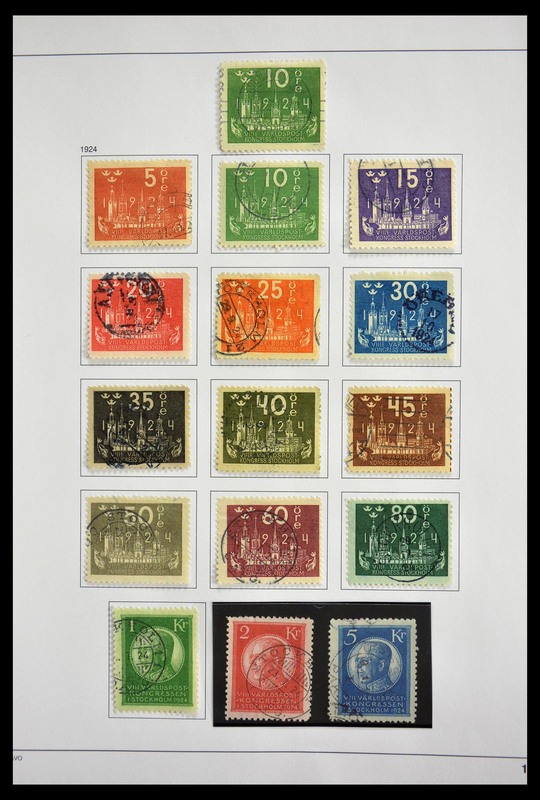 36604 postfrisch (never hinged) ** 1961/1992, stock of the Europa issues, complete sets mint never hinged. 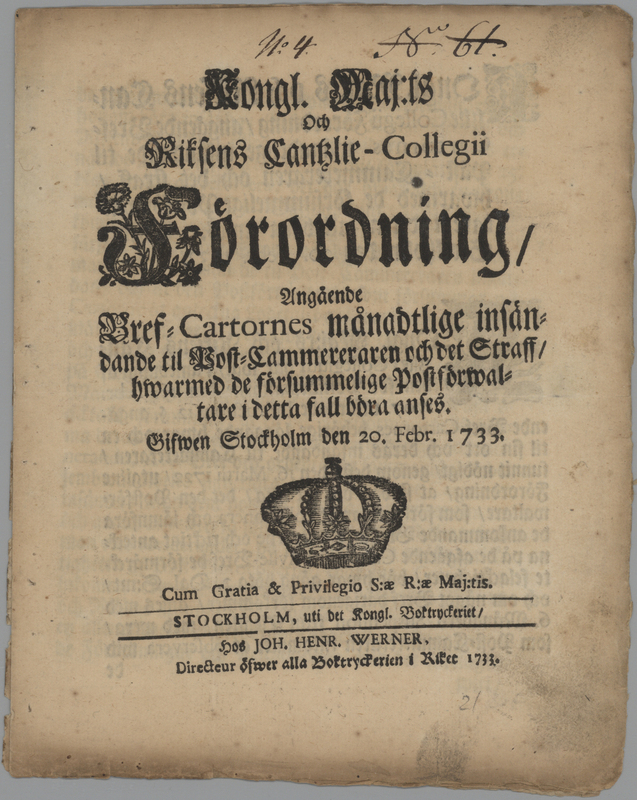 List of content enclosed and available in our online catalogue. 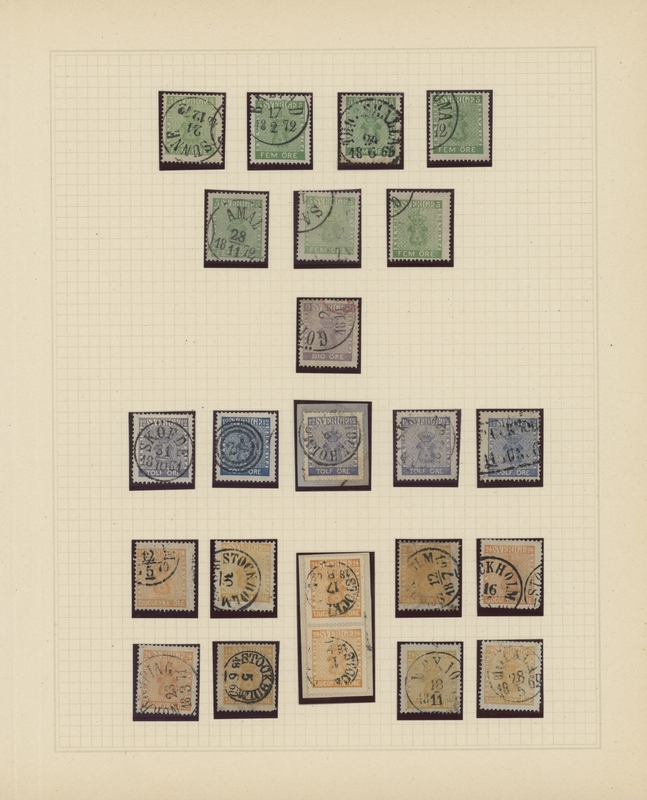 In total ca. 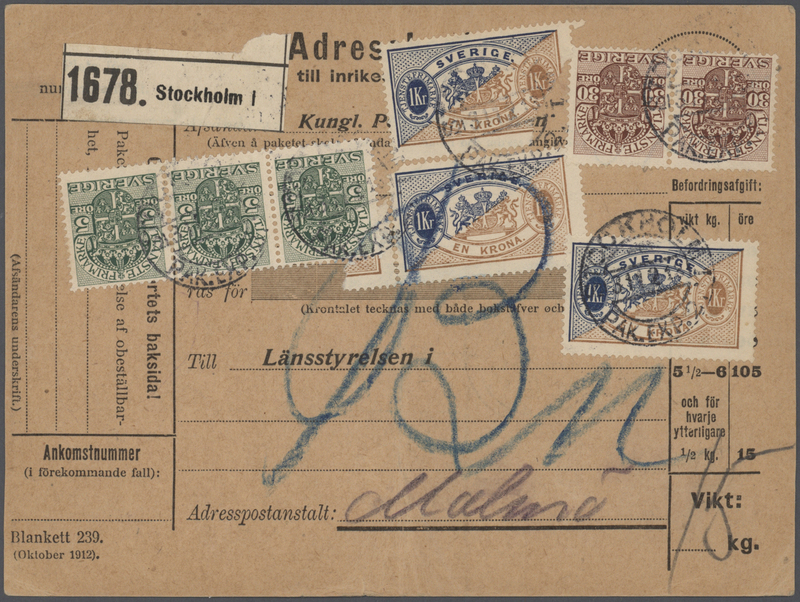 178.500 stamps. 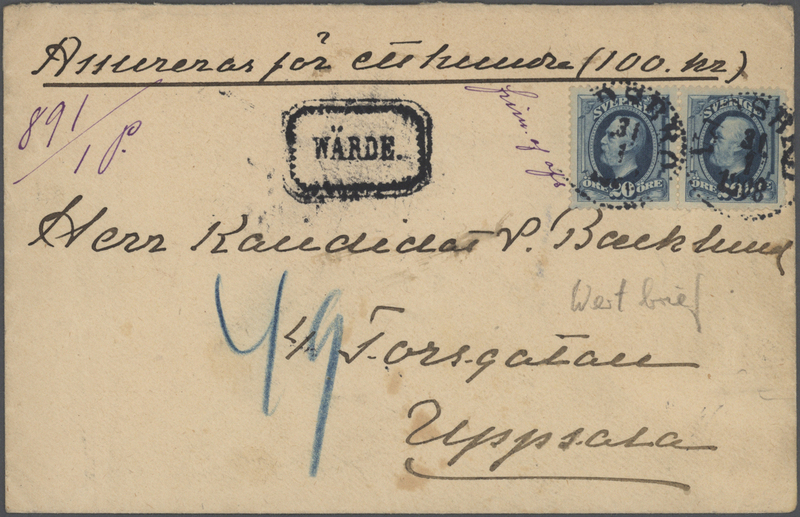 Michel at least 504.280,- €. 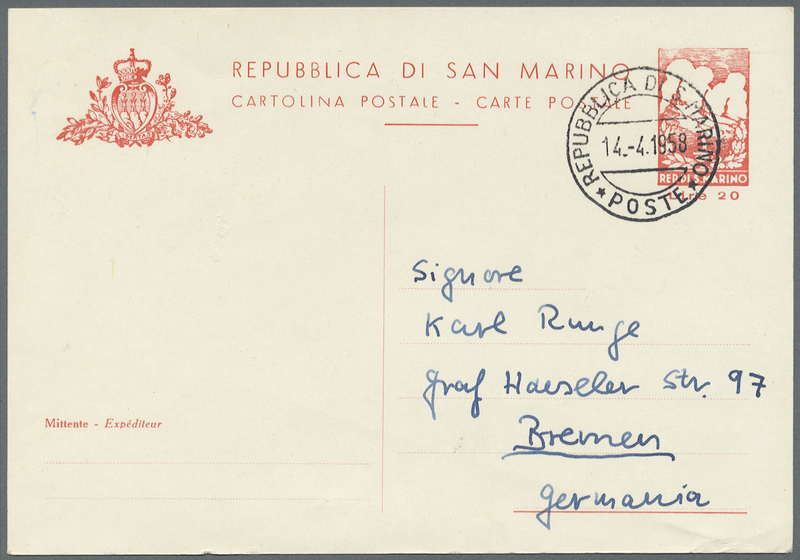 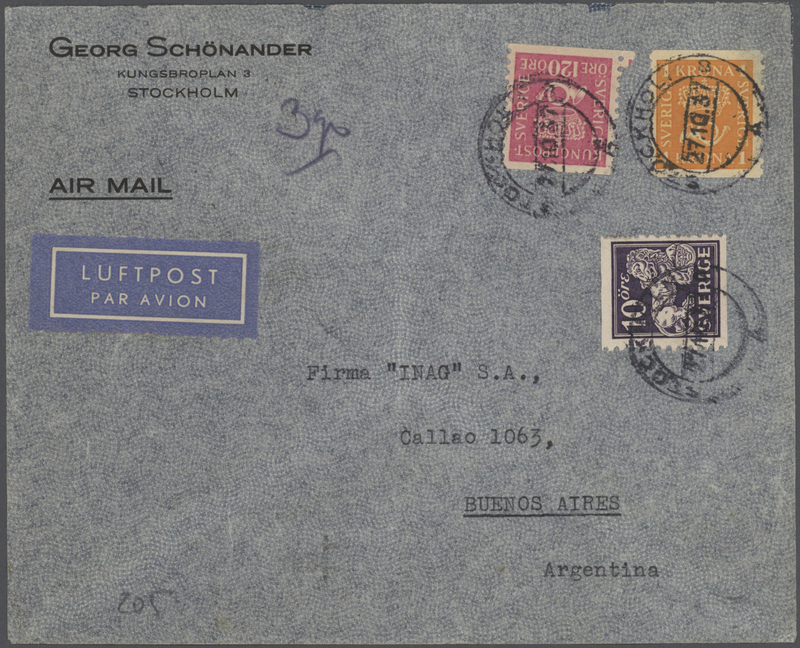 36606 postfrisch (never hinged) ** 1962/1988 (ca. 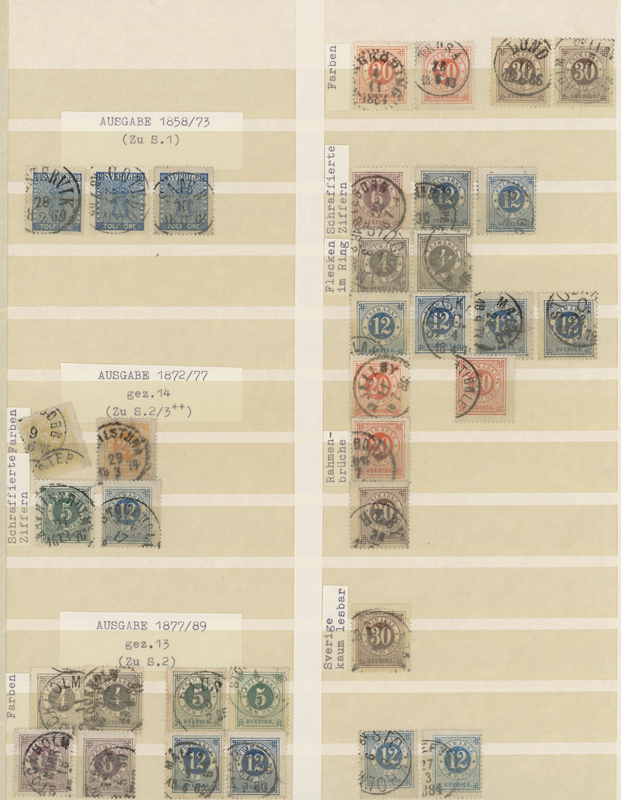 ), stock of the Europa issues MNH in two big boxes, mostly sorted by year but not counted at all. 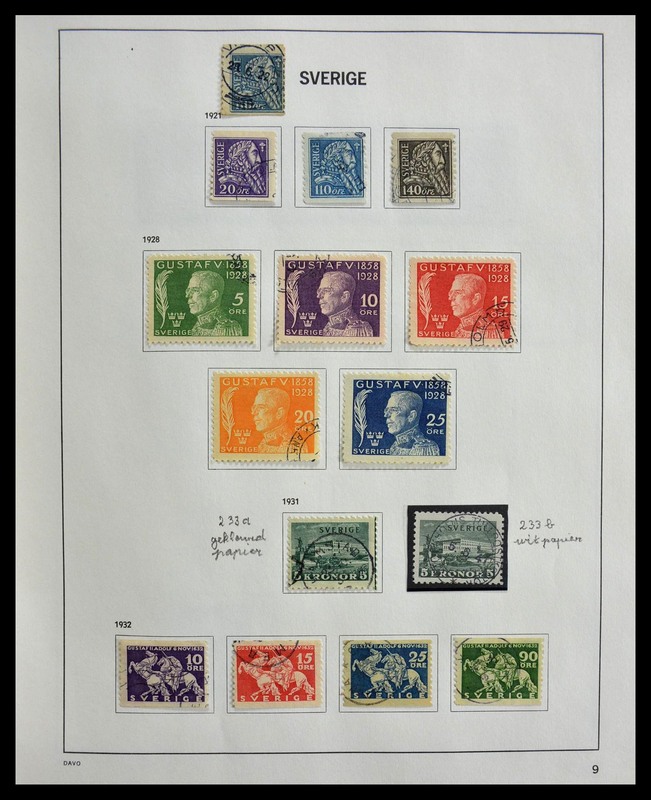 Gigantic catalogue value. 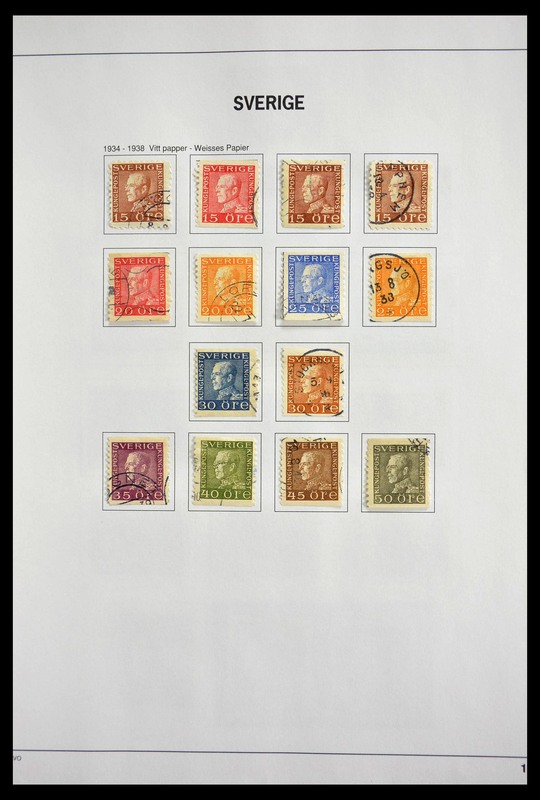 36607 postfrisch (never hinged) ** 1976/1981, stock of the Europa issues, complete sets mint never hinged: 1976 - 189, 1977 - 288, 1978 - 235, 1979 - 45, 1980 - 10, 1981 - 2100. 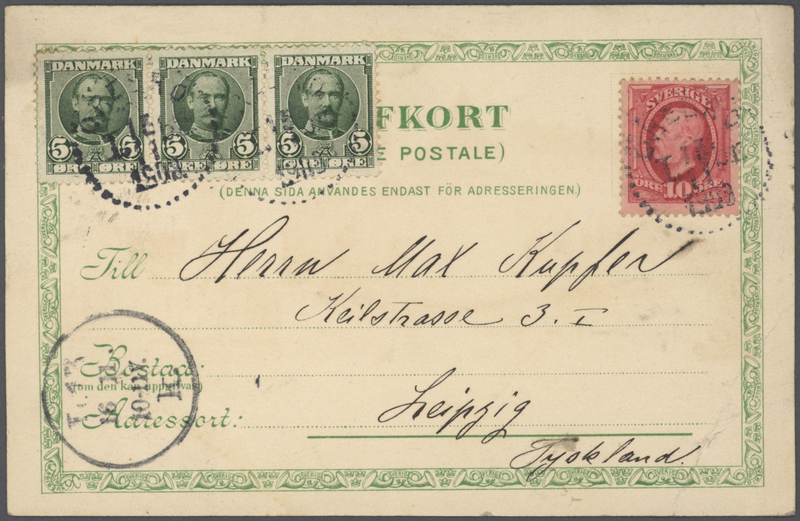 Michel 9866,- €. 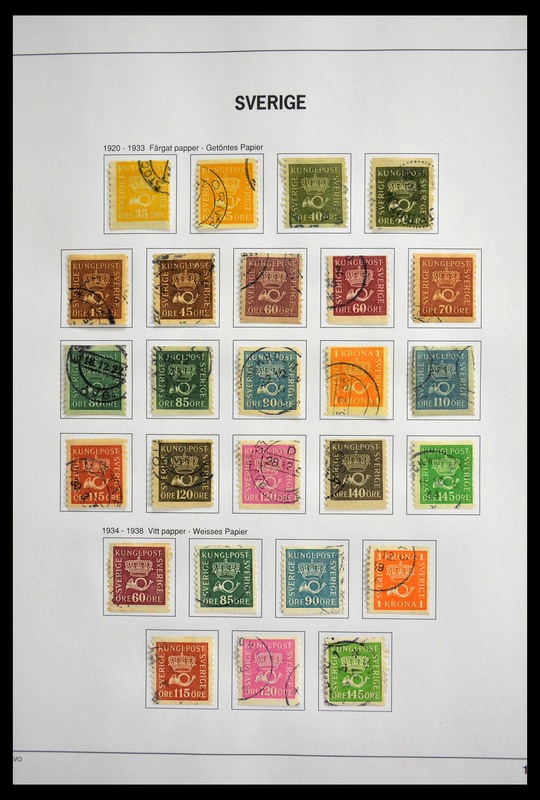 36608 postfrisch (never hinged) ** 1979/1991, stock of the Europa issues, complete sets mint never hinged: 1979 -600, 1980 - 1000, 1981 - 1800, 1982 - 800, 1983 - 800, 1985 - 1700, 1986 - 900, 1987 -900, 1988 - 1100, 1989 - 1600, 1990 - 400, 1991 - 700. 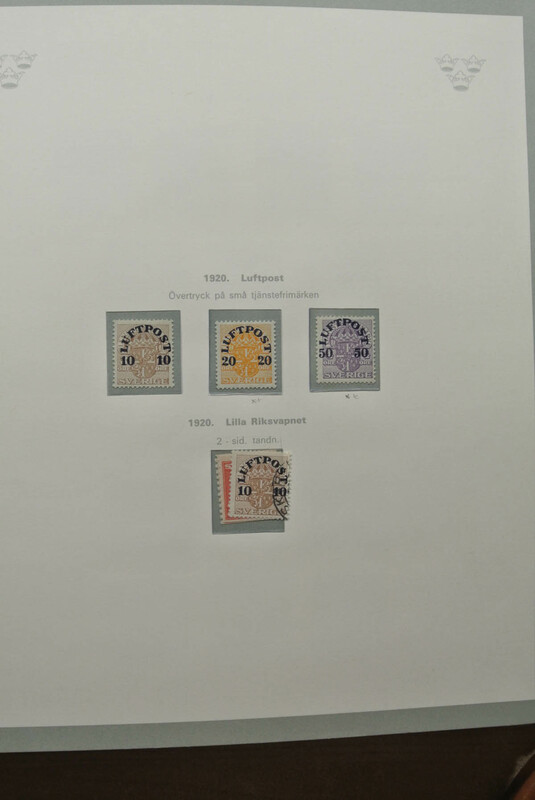 Michel 114.720,- €. 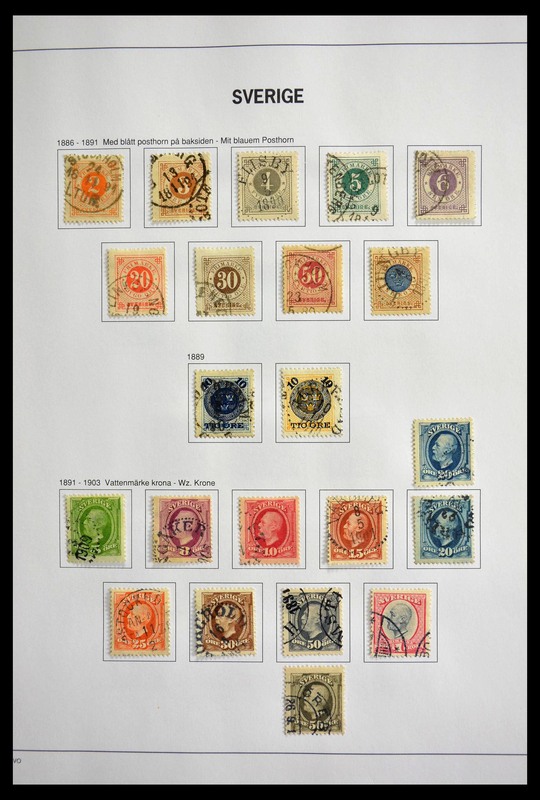 36609 postfrisch (never hinged) ** 1249/1250 (1700) 1982, Europa, 1700 sets of this issues, all mint never hinged. 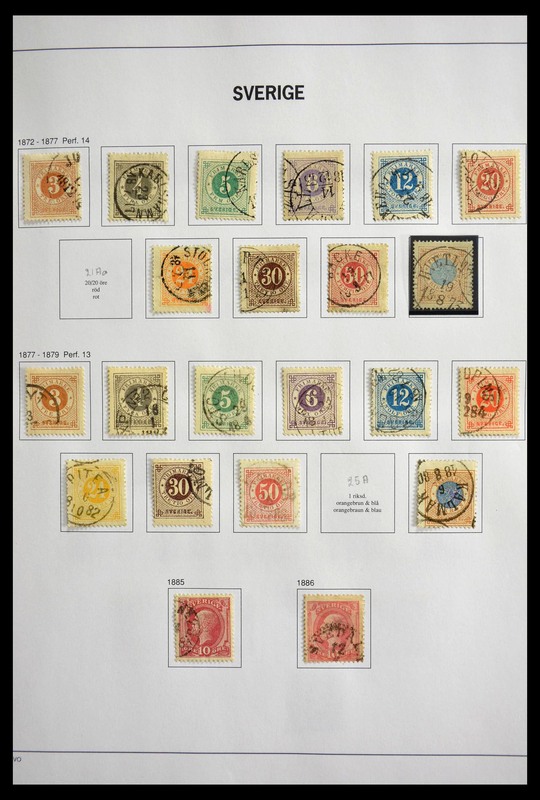 Michel 8500,- €, former face value 1275000 Lire. 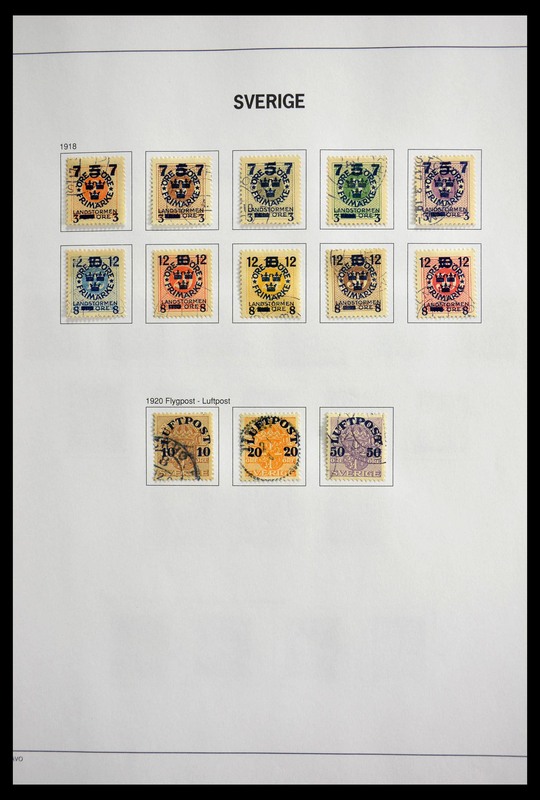 36610 postfrisch (never hinged) ** 1985/1998, stock of the Europa issues out of these years (not all included), in various amounts (list enclosed) from 60 sets (1985/86; 1998) up to 956 blocks (1989). 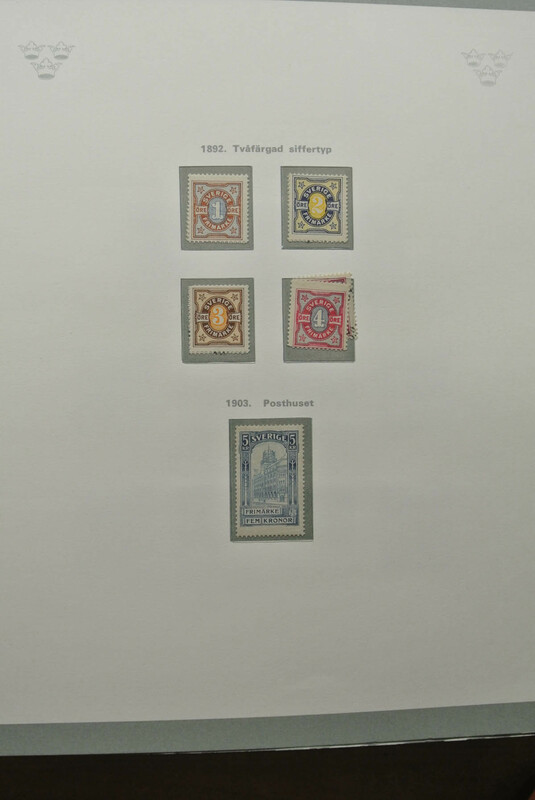 Michel 34000,- €. 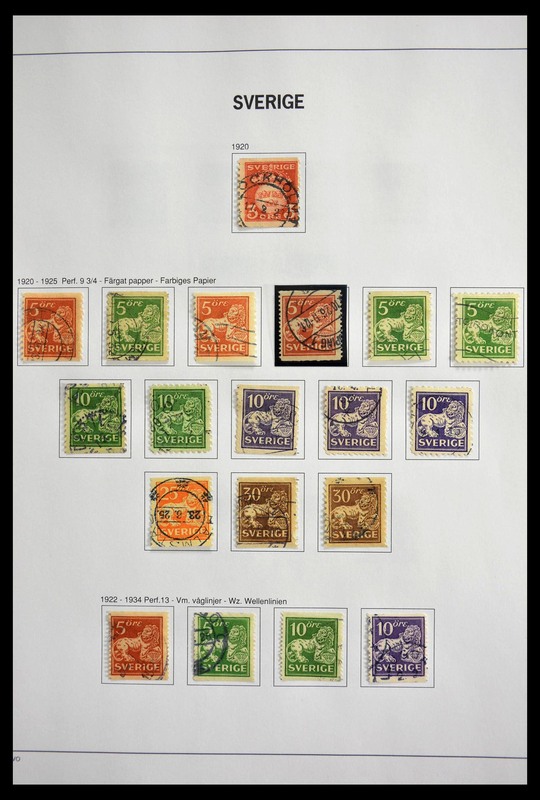 36611 postfrisch (never hinged) ** 1339/1340 (600) 1986, Europa (deer & falcon), at least 600 sets of this issue, probably much more, mint never hinged, often in sheets and parts of sheets. 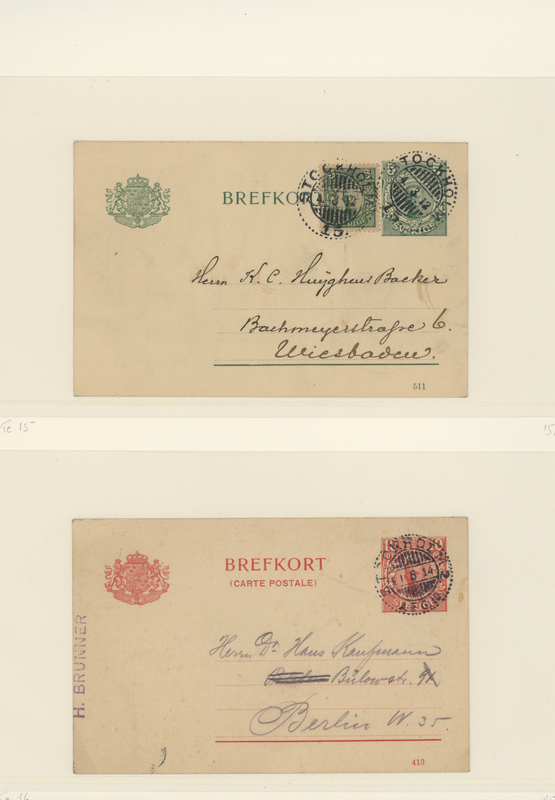 Michel at least 15000,- €. 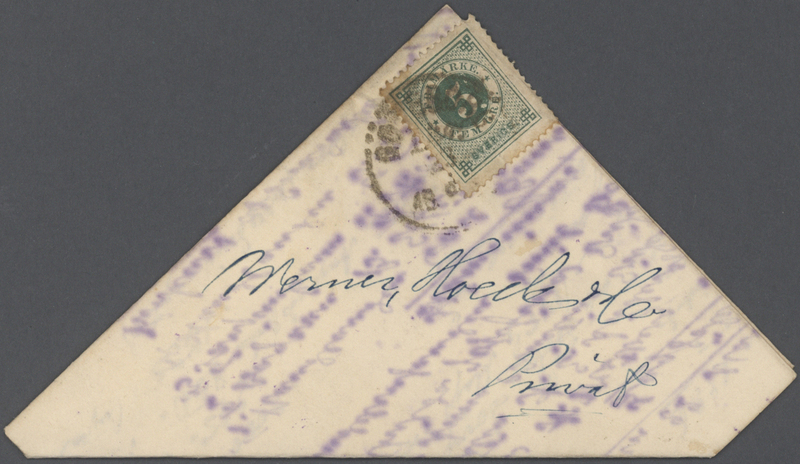 36612 postfrisch (never hinged) ** Bl. 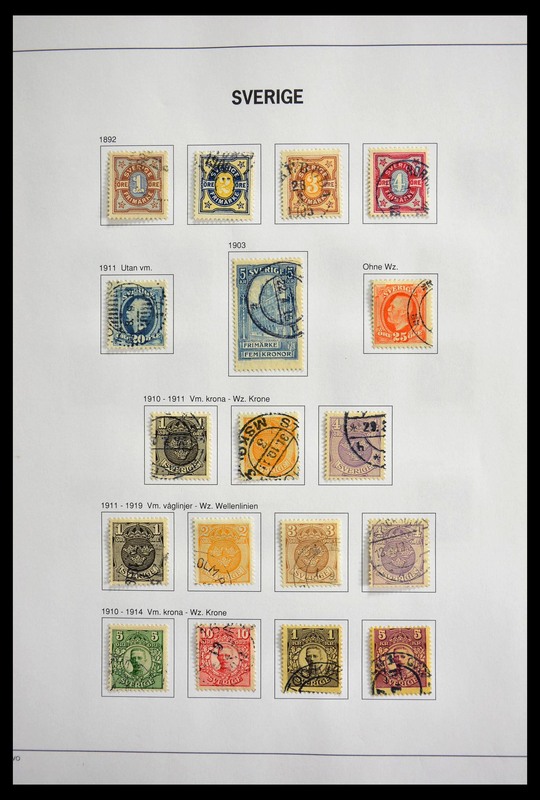 12 (1800) 1989, Europa, 1800 copies of this block, all mint never hinged. 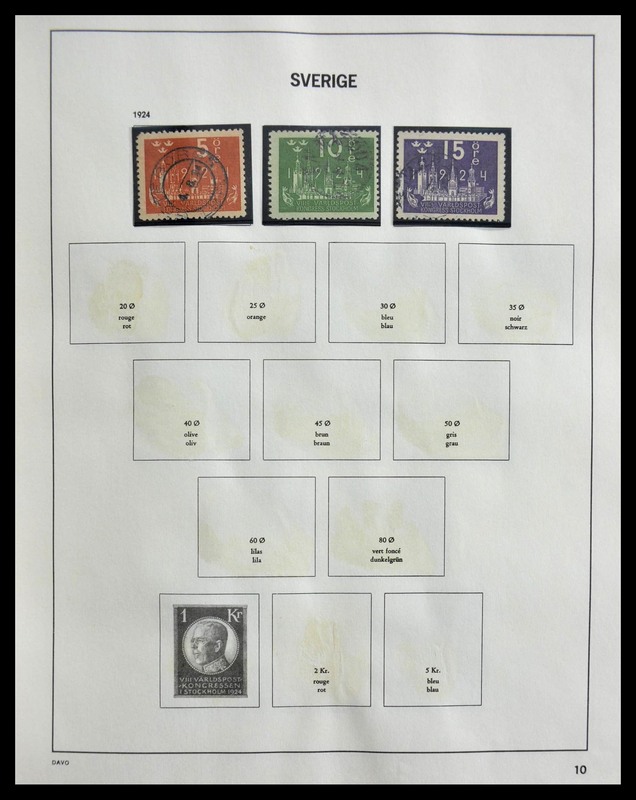 Michel 21600,- €. 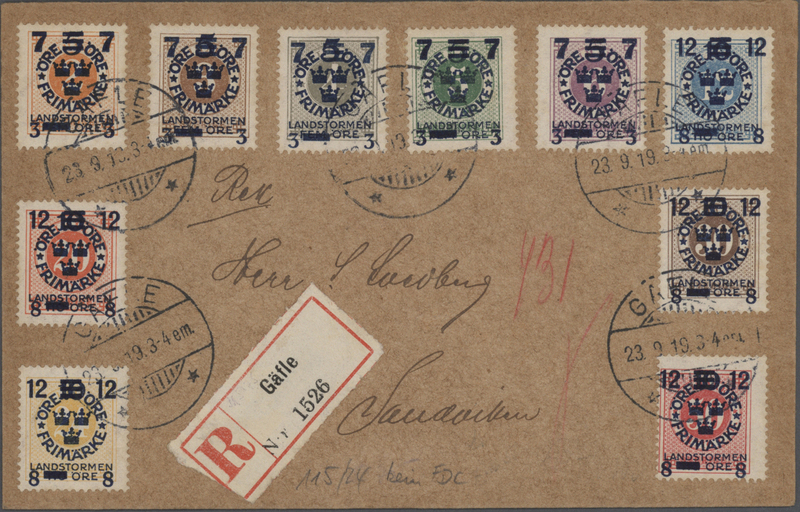 36613 postfrisch (never hinged) ** 1992/1993. 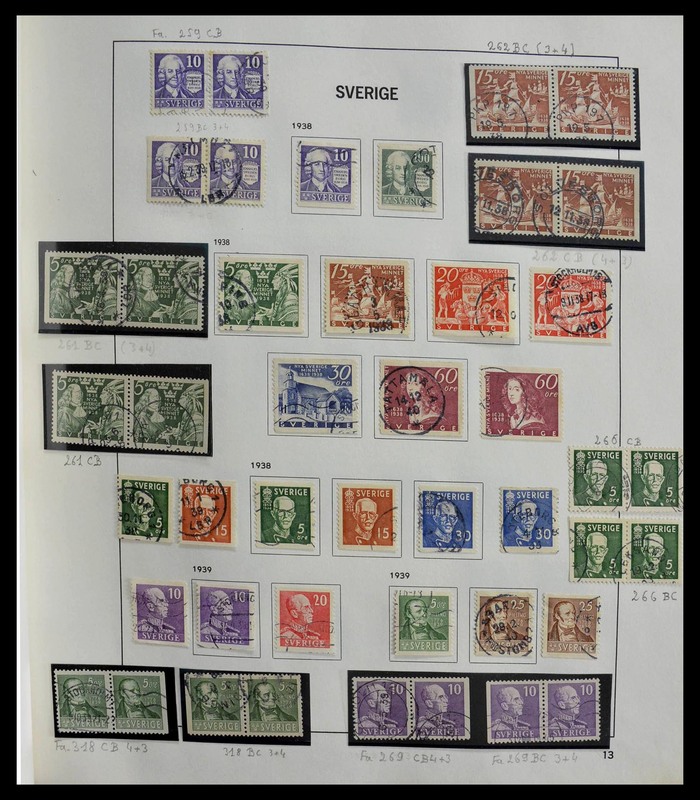 stock of the Europa issues: 1992 - 769 sets and 1993 - 800 sets, all mint never hinged. 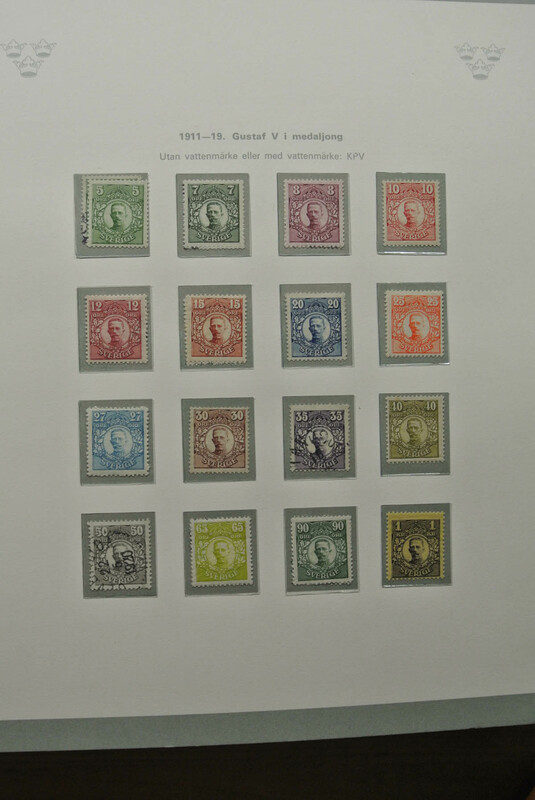 Michel 9721,- €. 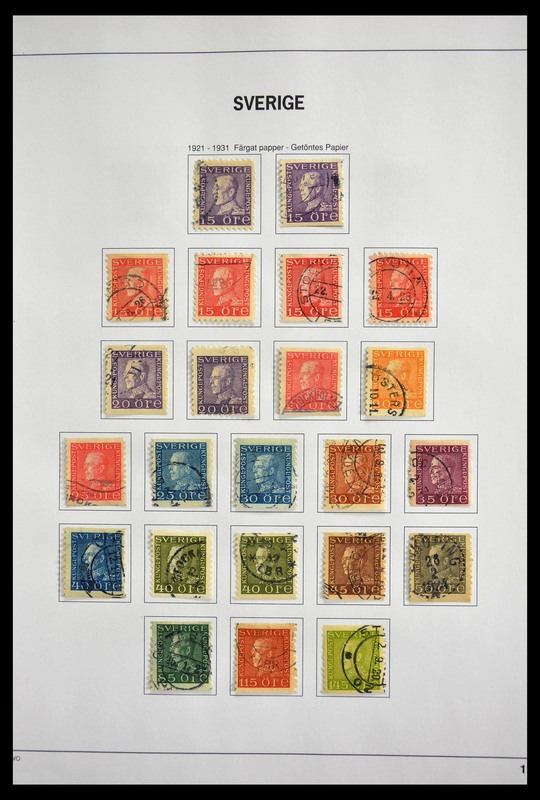 36614 postfrisch (never hinged) ** 1994/1995, Europa, 390 sets of the 1994 issue and 2000 sets of 1995 mint never hinged. 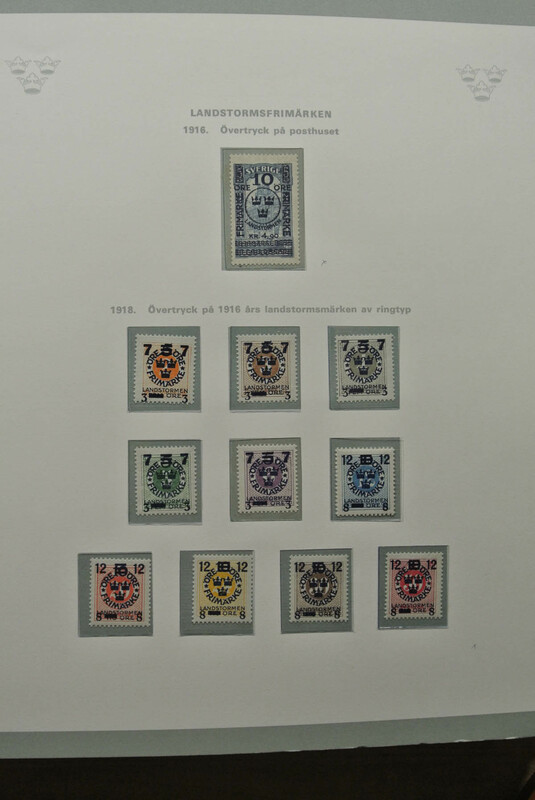 Michel 4858,- €. 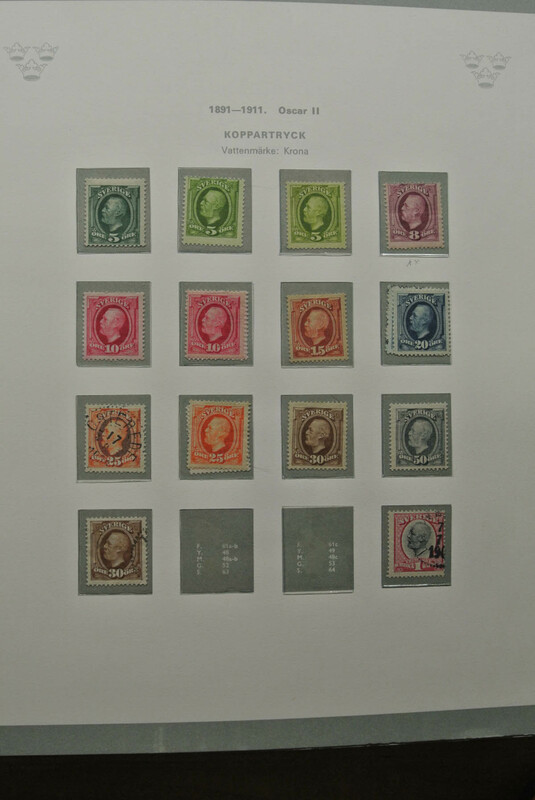 36620 gestempelt (marked) ungebraucht (hinged) * 1855/1954, comprehensive collection with strength in the classic and semi-classic period, partly collected severalfold, incl. 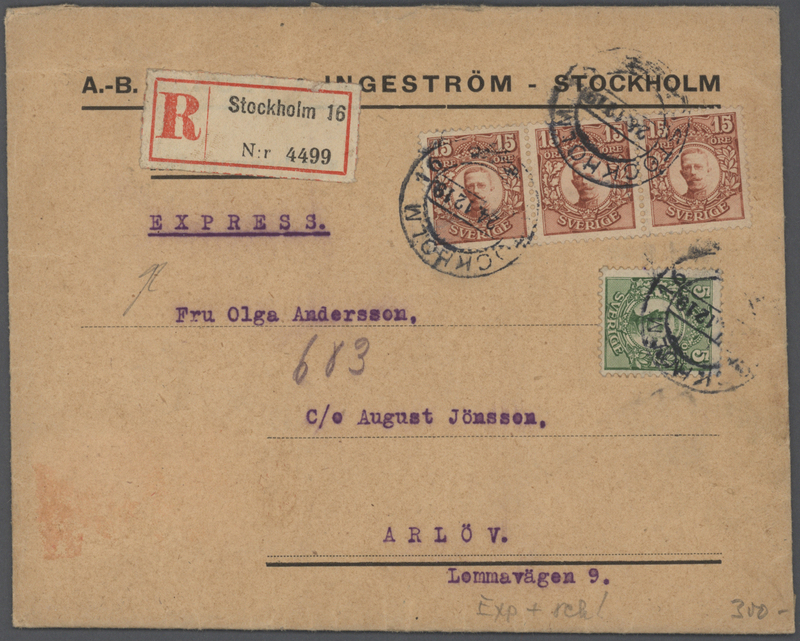 better stamps like 8sk. 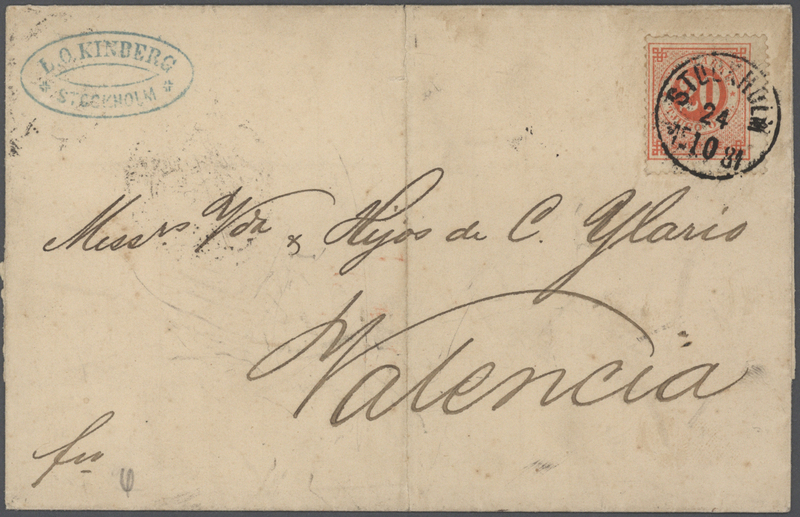 orange, 1856 local stamp, Coat of Arms incl. 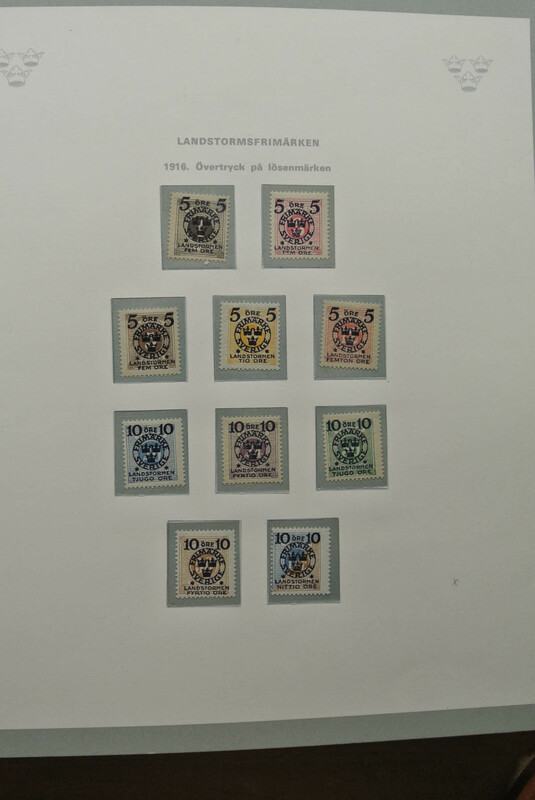 9ö. 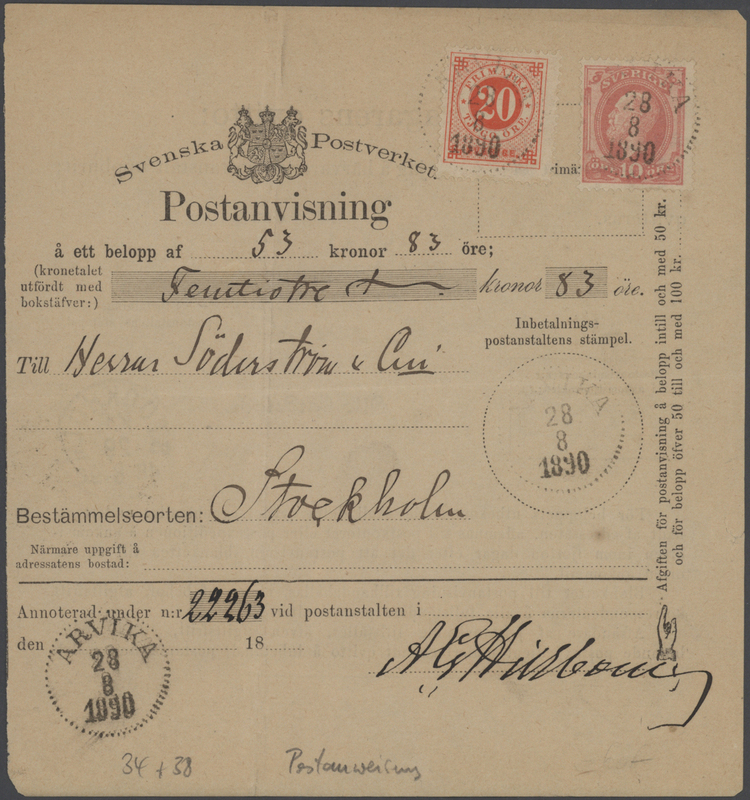 violet, 17ö. 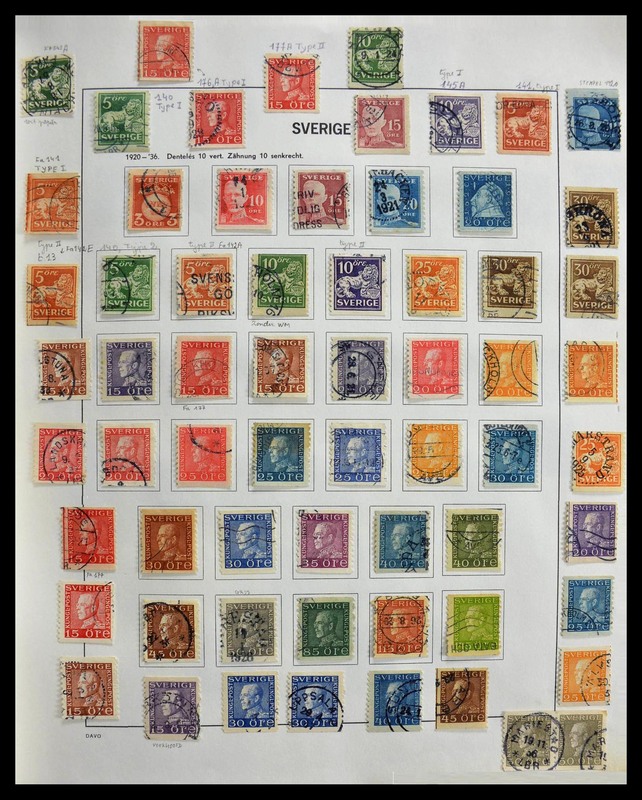 violet, following issues also collected intensively, Landstorm, commemoratives, partly showing some specialisation in perfs etc., nice collection in chielfy good condition, high cat.value! 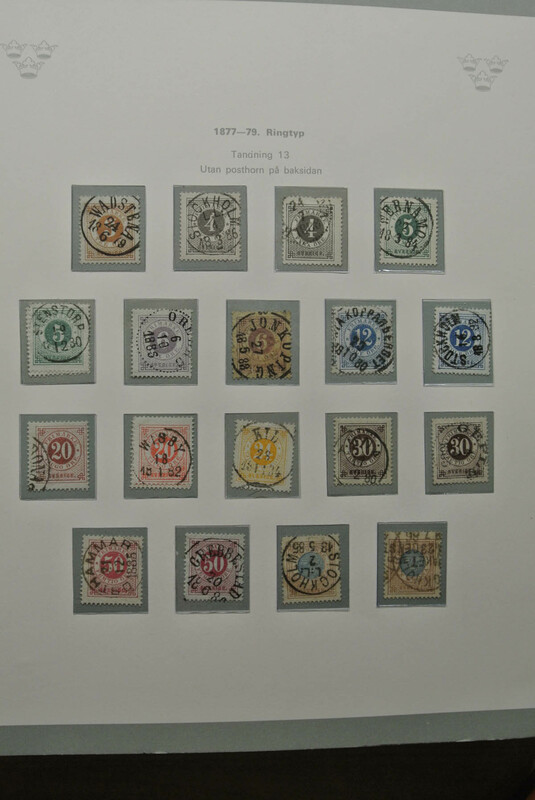 36624 gestempelt (marked) 1855-1990, gestempelte Sammlung ab Klassik in zwei Vordruck-Alben, dabei viele gute und bessere Ausgaben ab Klassik, Paare aus Heftchen, komplette Sätze und kleine Besonderheiten, dazu Album mit Paketkarten, ansehen lohnt. 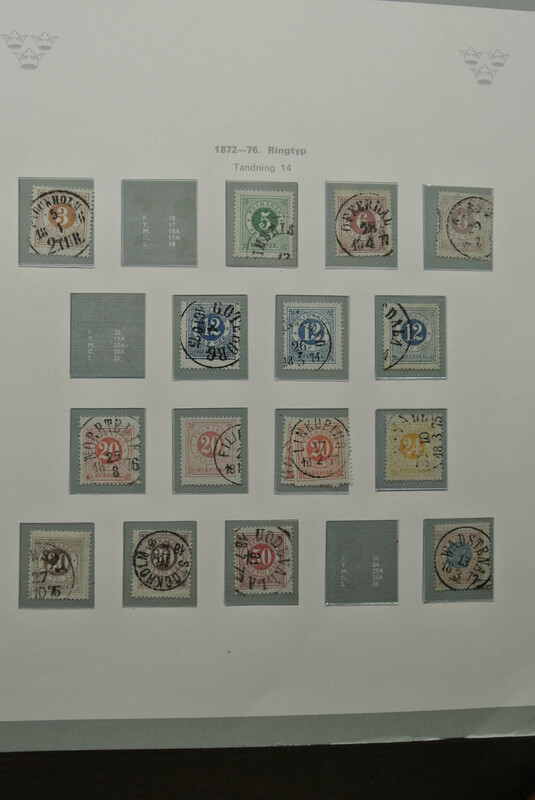 36627 gestempelt (marked) 6, 10, 11, 13, 16, 2 1856-78, group of 17 used stamps, with three singles of 1856 local stamp in black, two singles 1862 local stamp in brown, three 1858-66 24øre orange, five 30øre brown, two singles 1866-72 20øre red, an 1872 1 riksdaler and one 1878 1k., with many different colour shades, all used with mostly fine strikes of Star and Rays h/s (on 1856 locals) or circled datestamps from Lund, Norrköping, Nyköping, Stockholm, Vesterås and others. 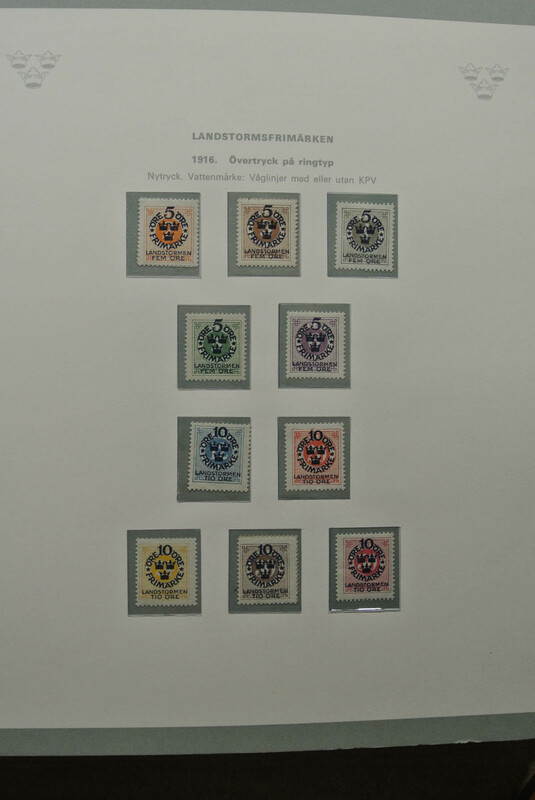 Some stamps with minor imperfections but still good to fine. 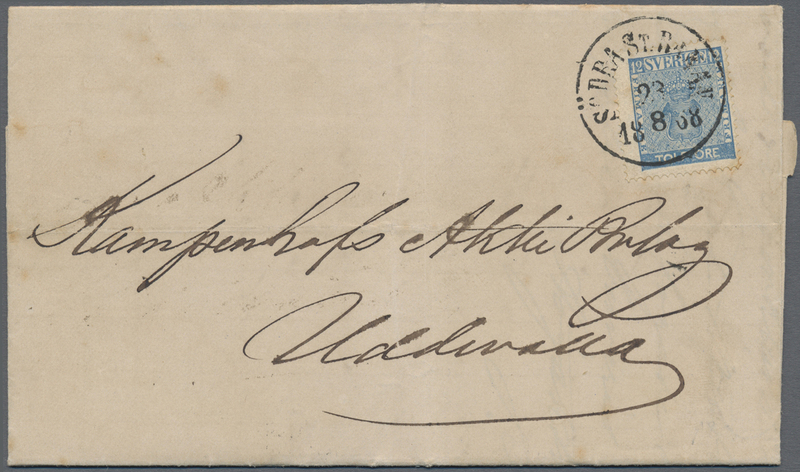 36628 Brief (cover) Ganzsache (Complete) FDC Ansichtskarte (Picture postcard) 1857/1990 (ca. 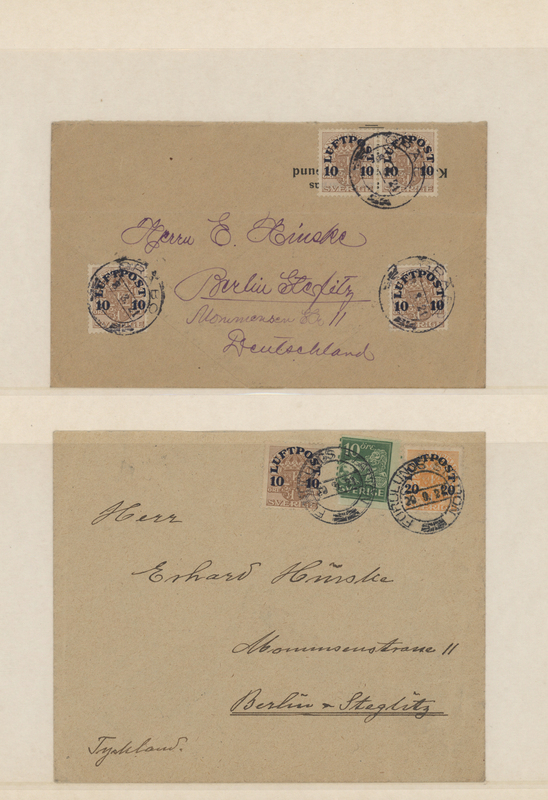 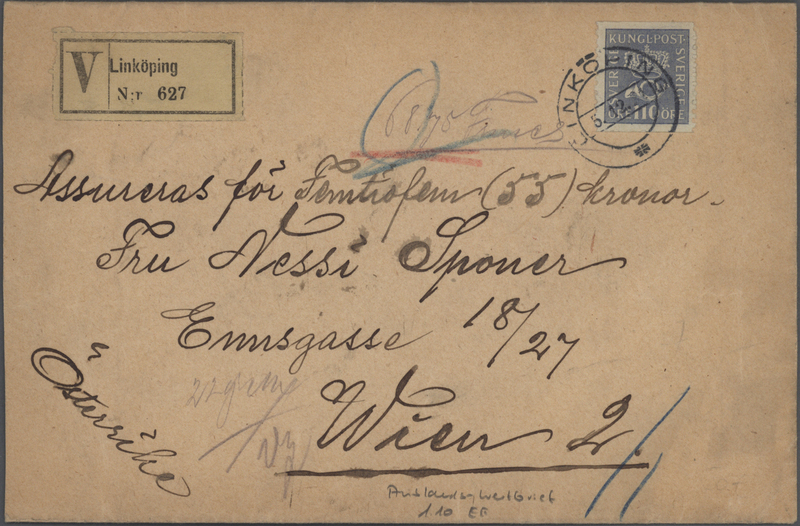 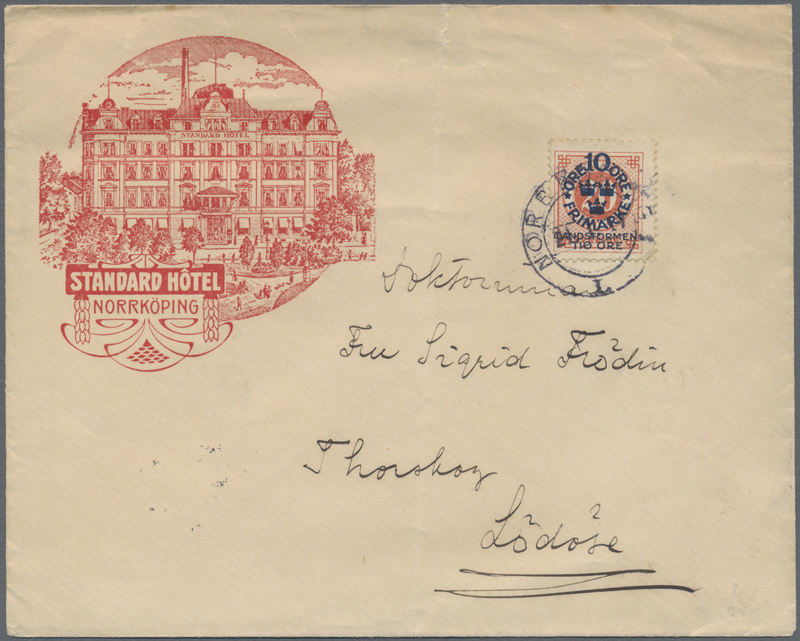 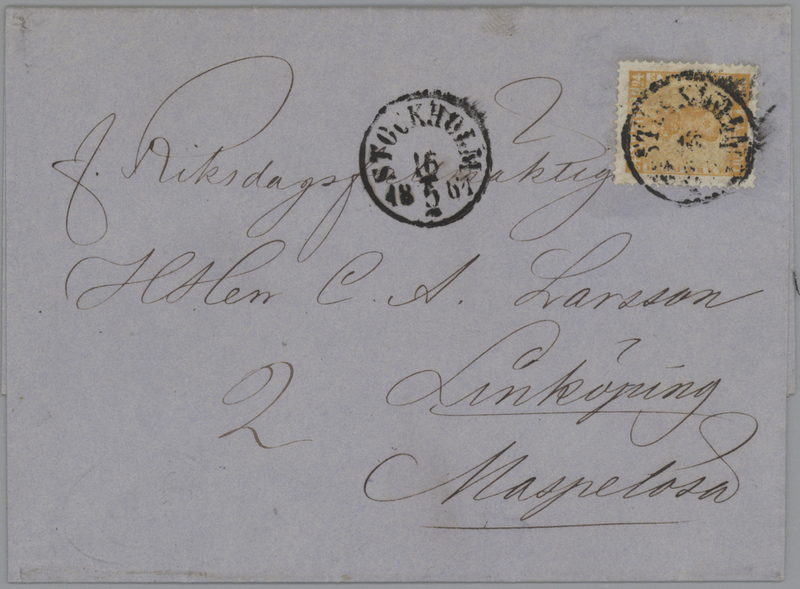 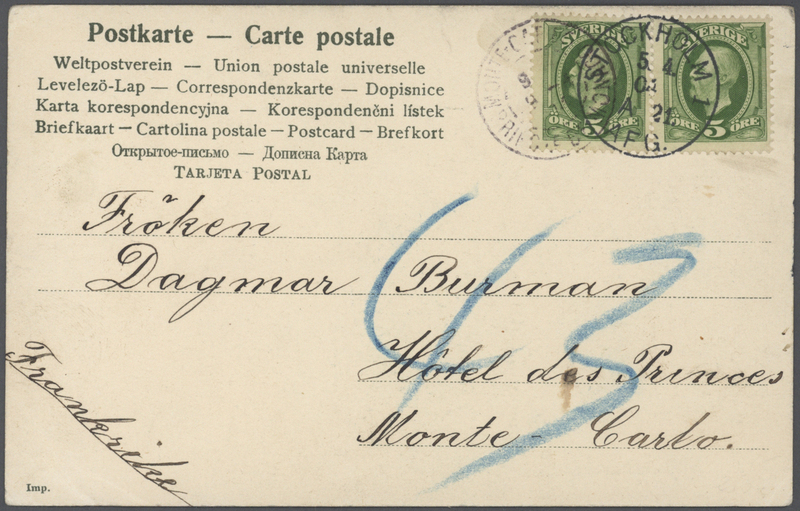 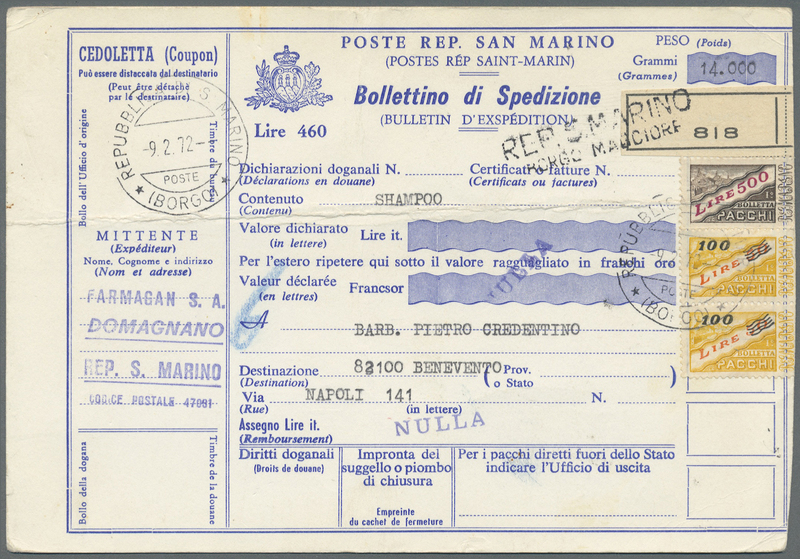 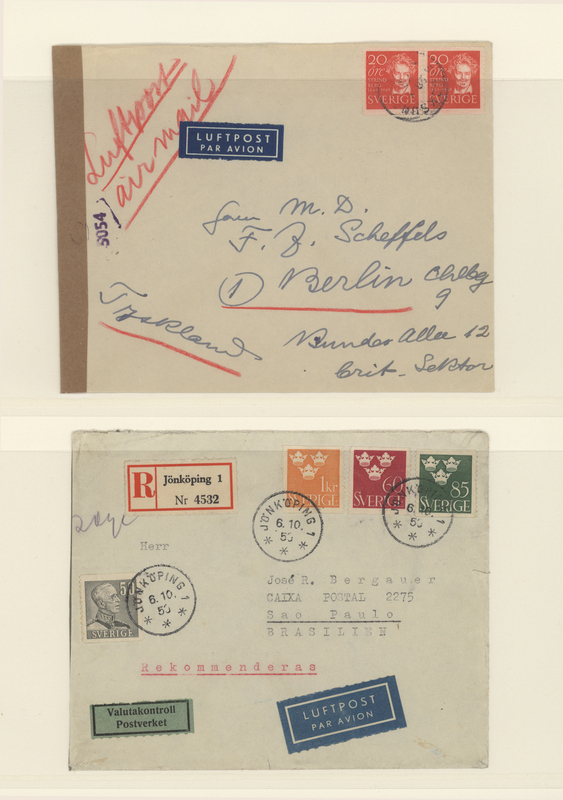 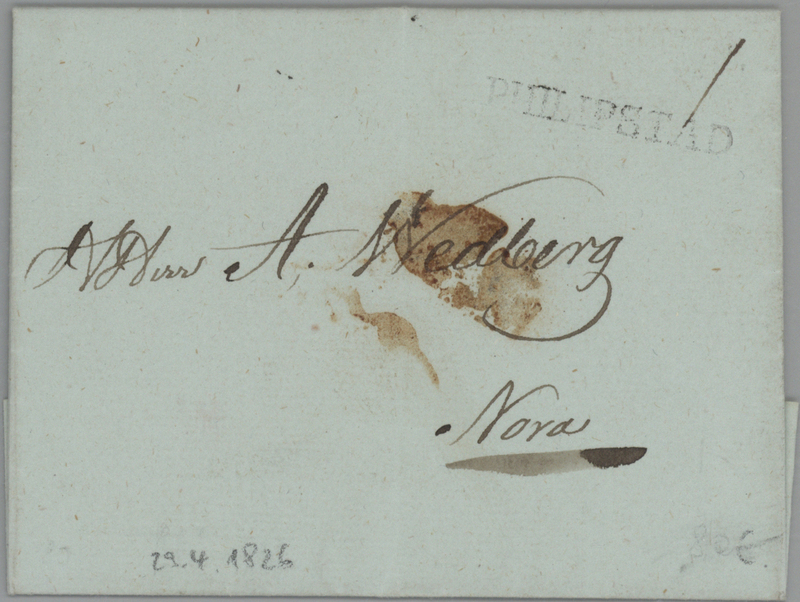 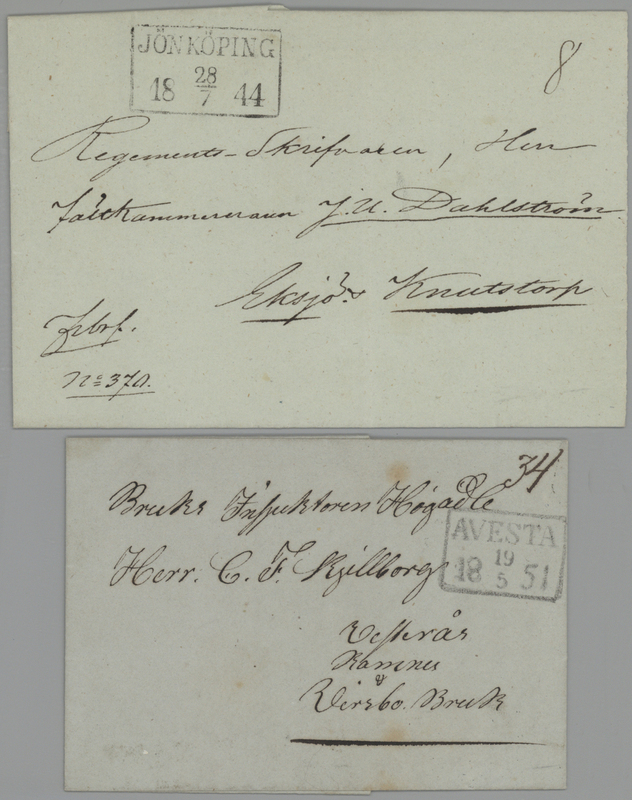 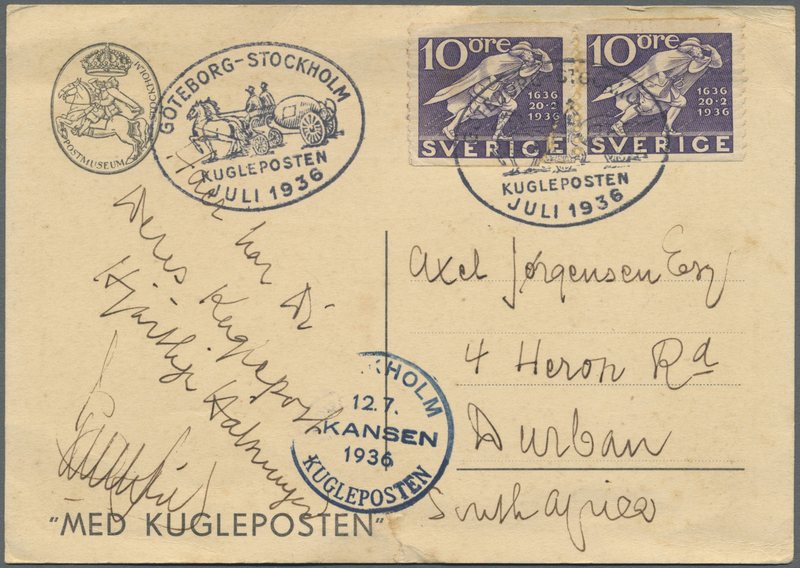 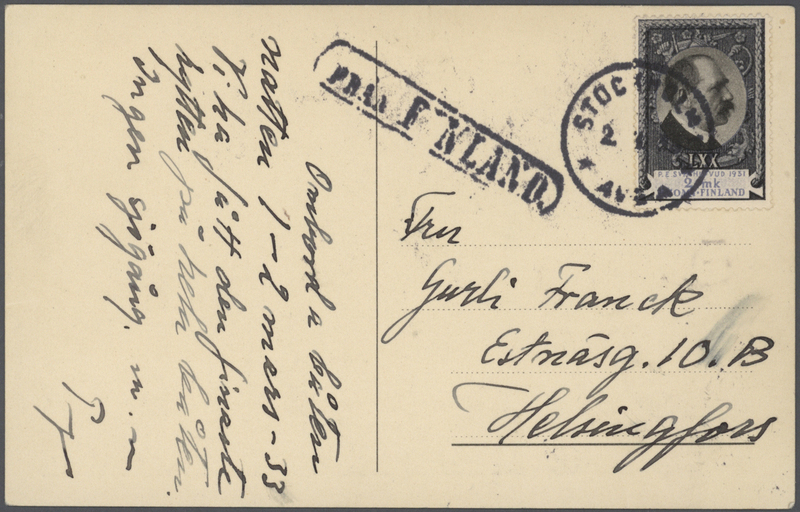 ), accumulation of several hundred covers/cards/stationeries/ppc, comprising a vast range of cancellations incl. 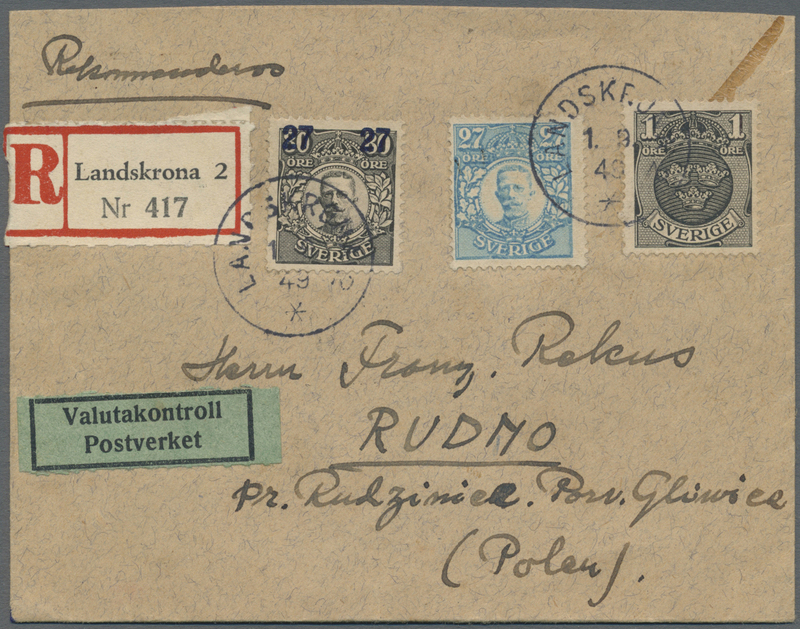 special event postmarks, registered and airmail etc. 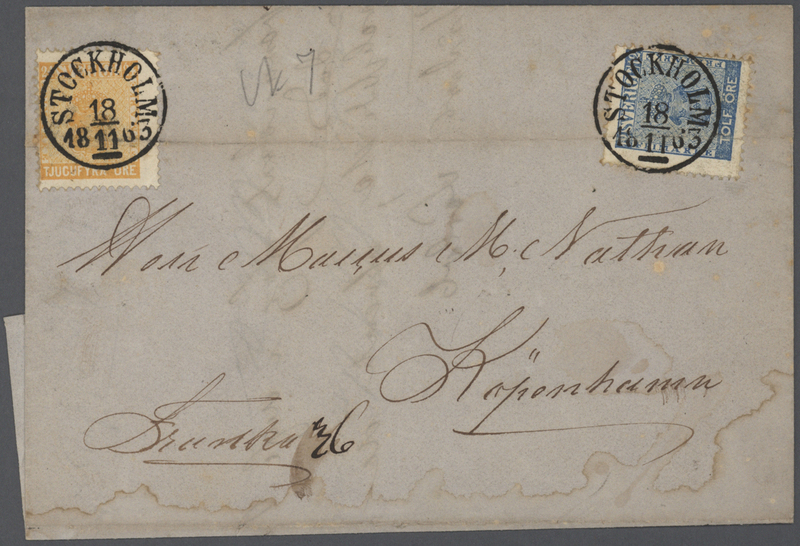 Great source of postal history, needs careful viewing! 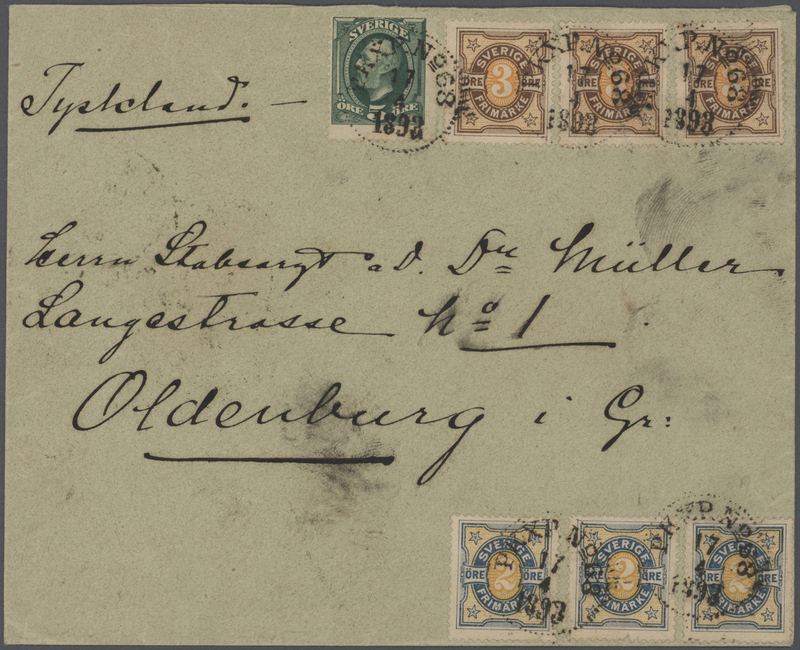 36629 gestempelt (marked) Brief (cover) Ganzsache (Complete) 1858/1998, used colllection/accumulation in three Schaubek albums, well sorted from ancient to modern with many interesting issues neatly cancelled, in addition four Schaubek albums with apprx. 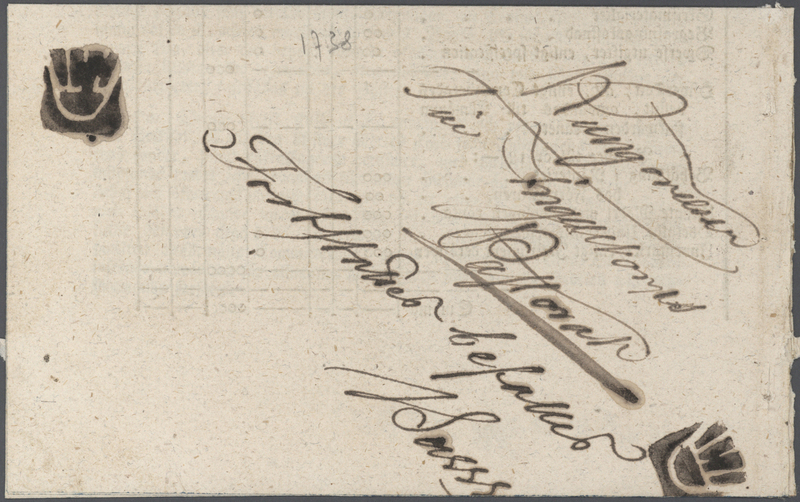 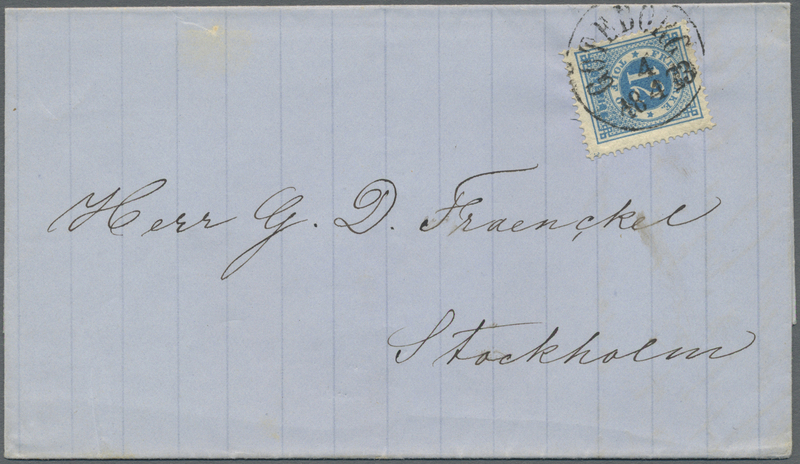 250 covers/cards/stationeries/f.d.c. 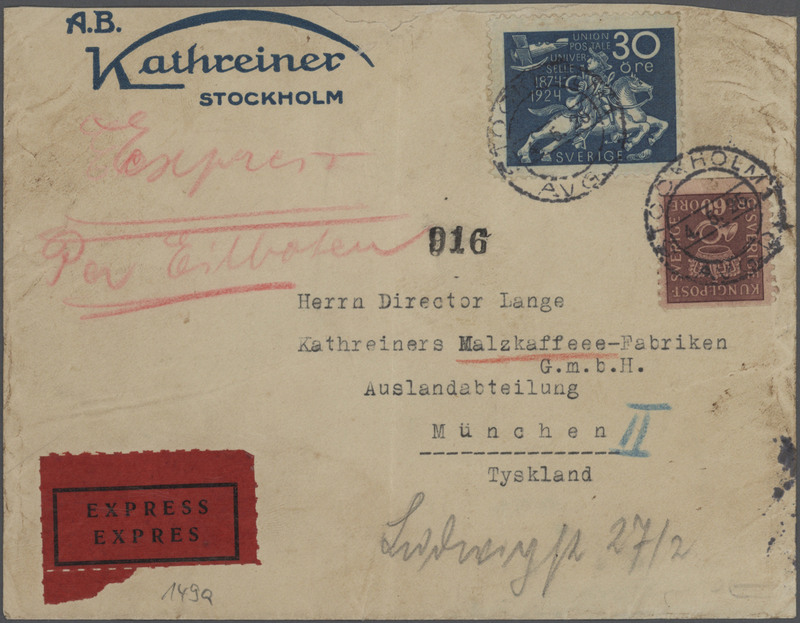 Viewing recommended! 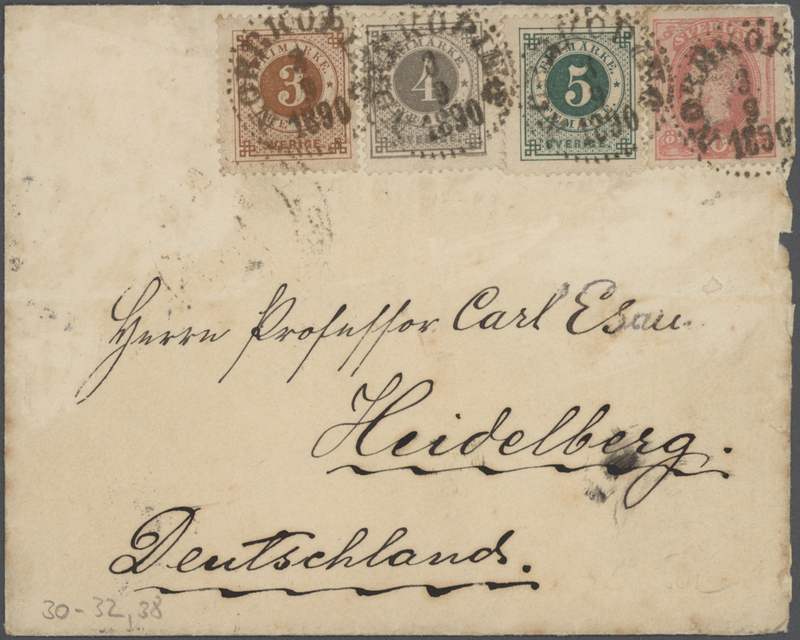 36630 gestempelt (marked) 1858-1930's ca. 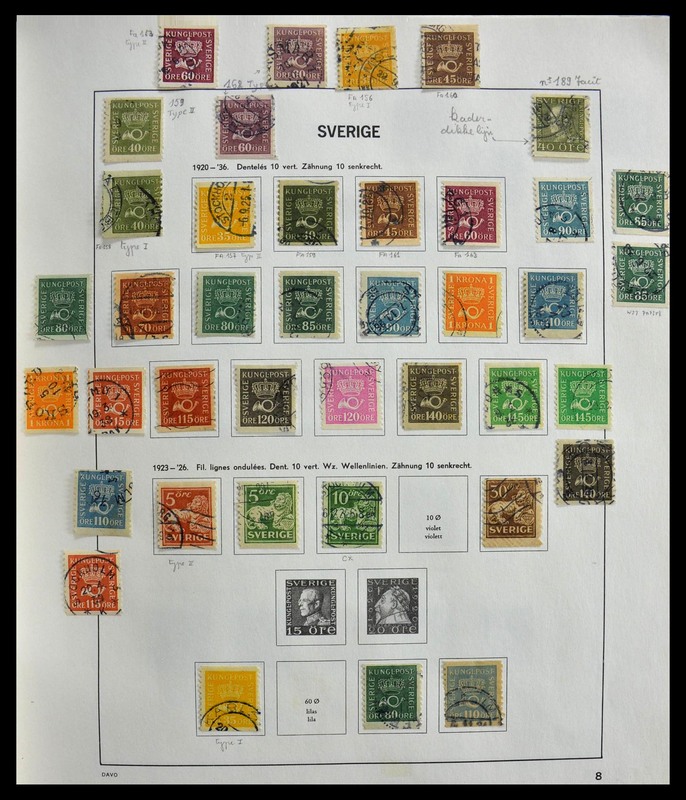 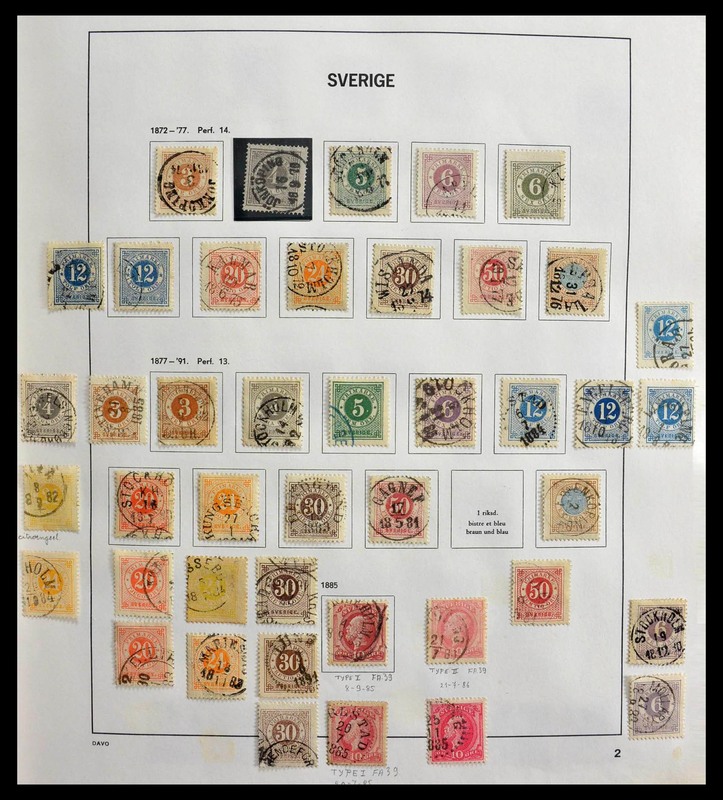 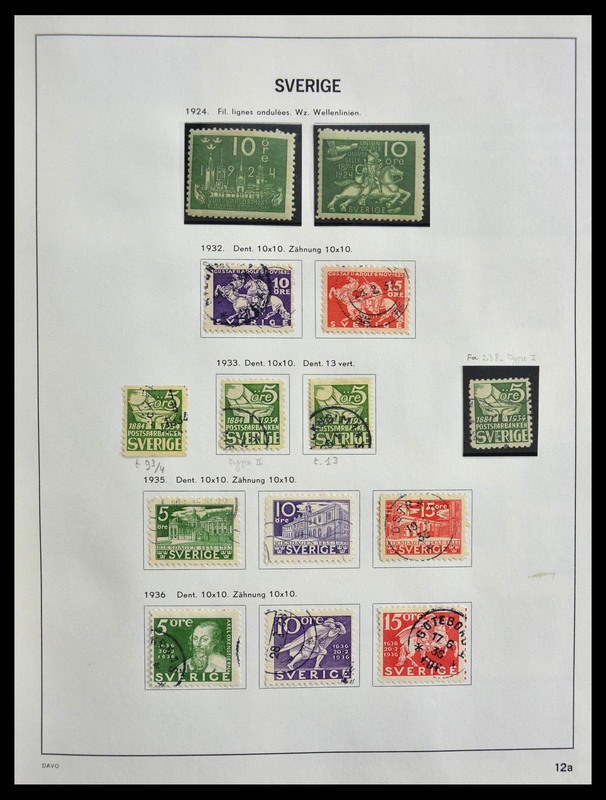 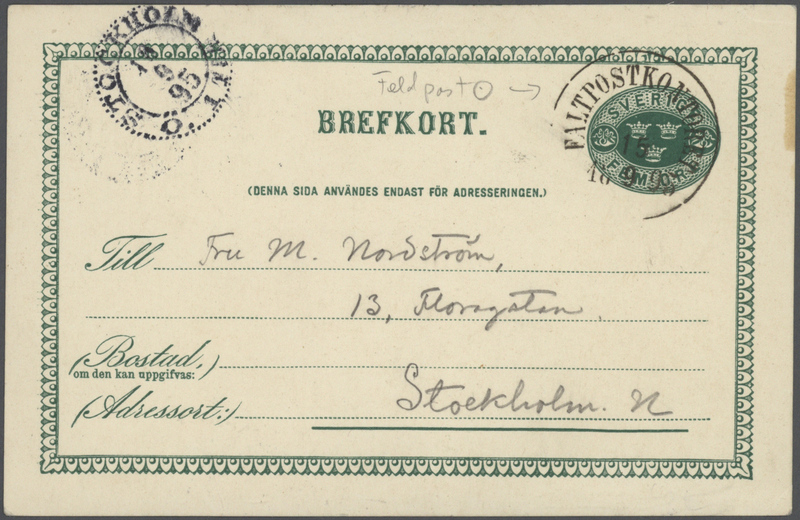 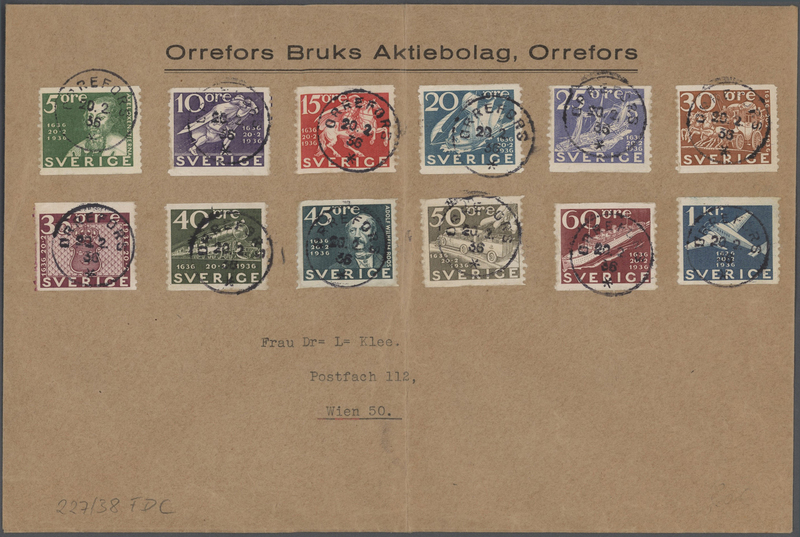 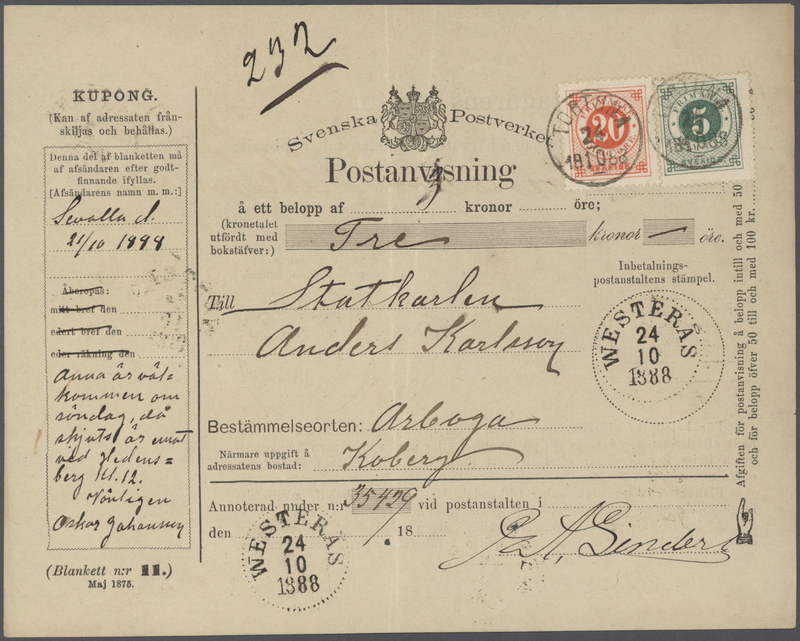 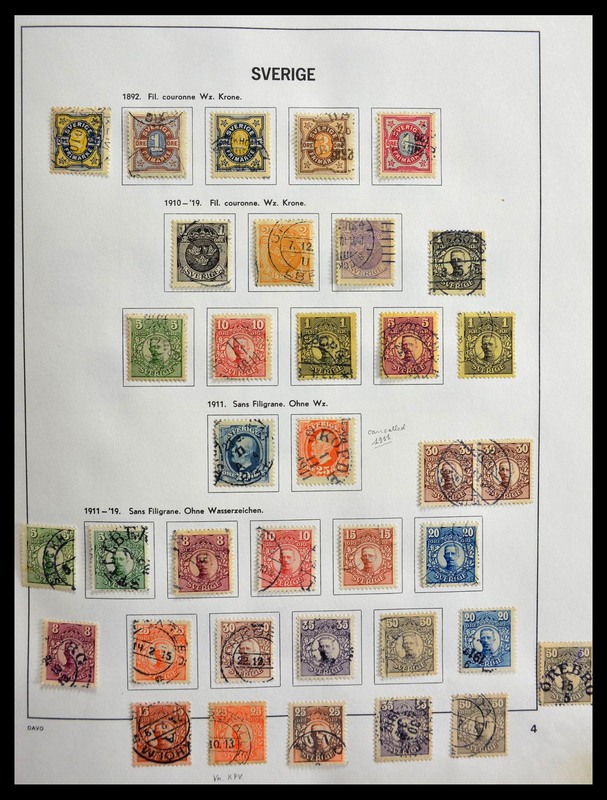 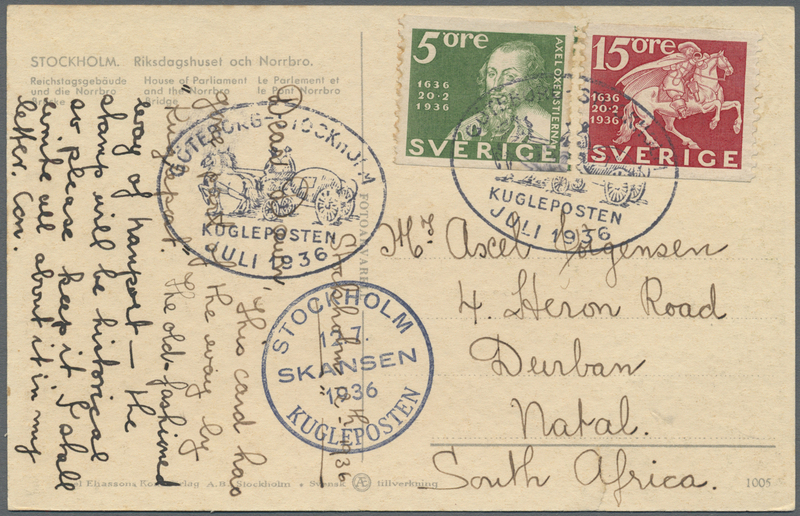 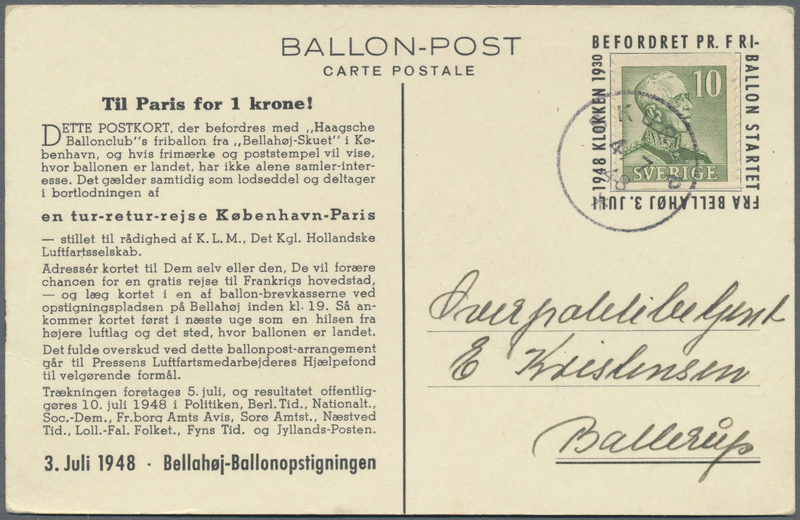 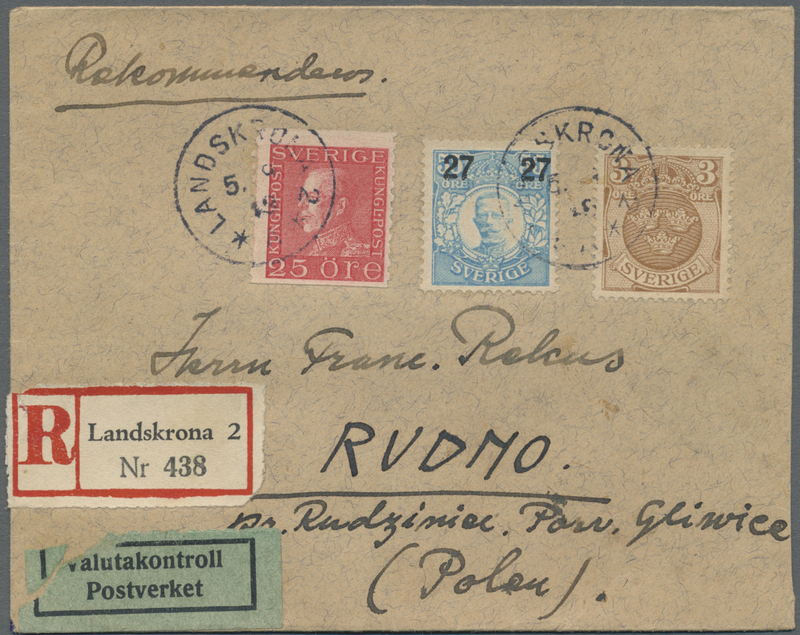 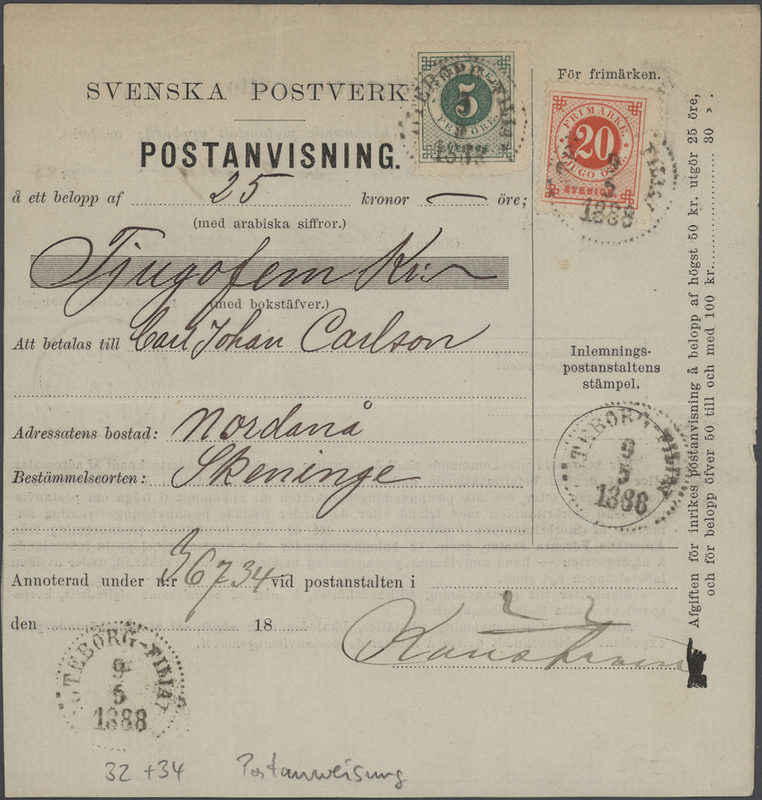 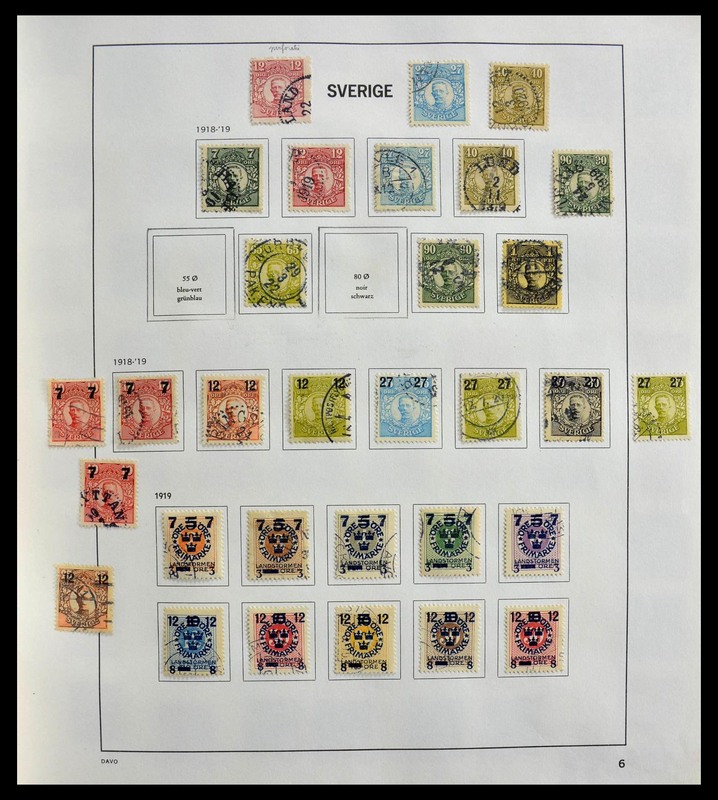 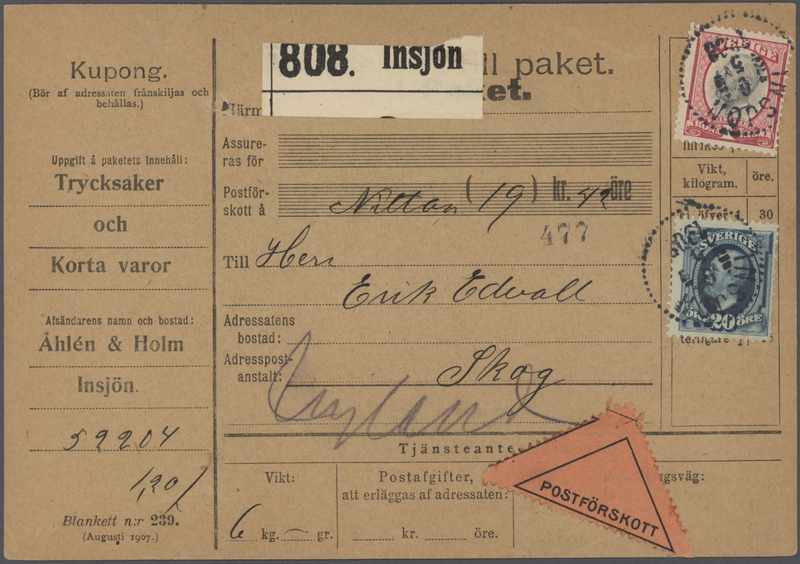 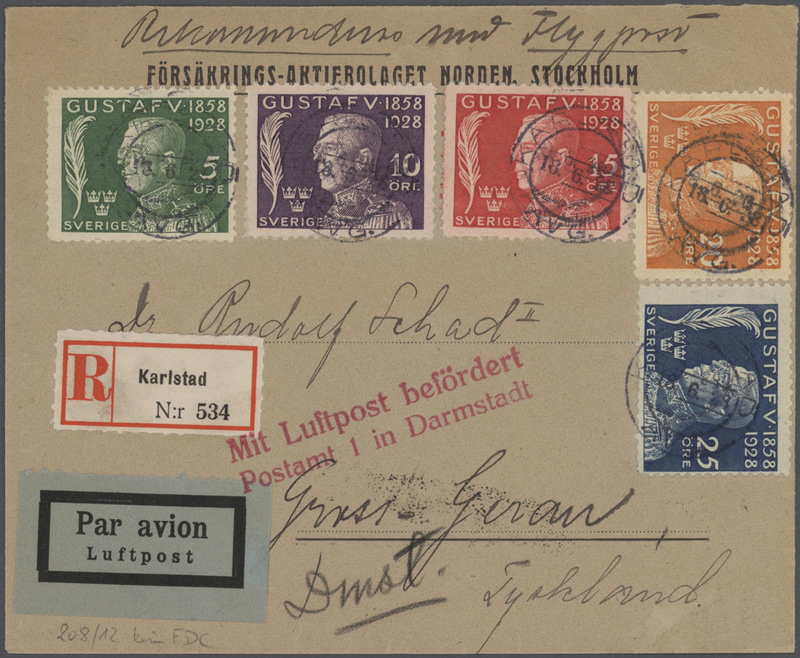 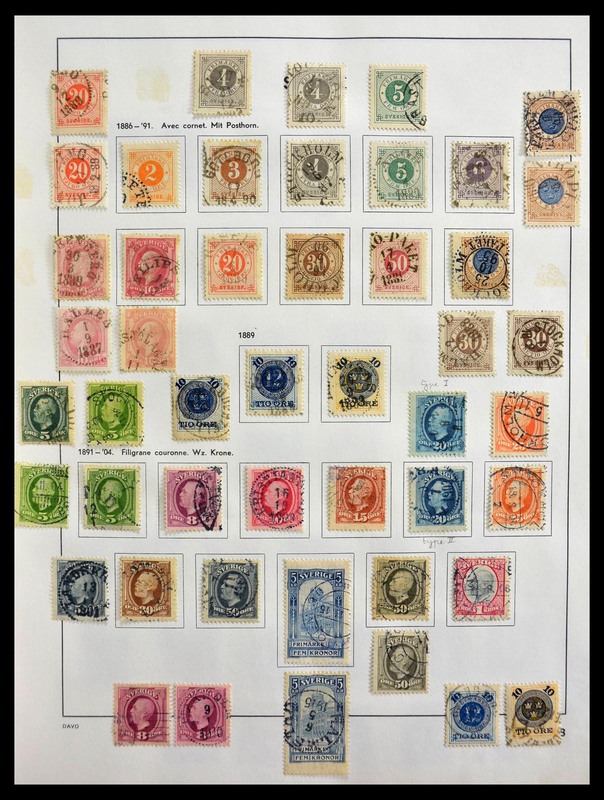 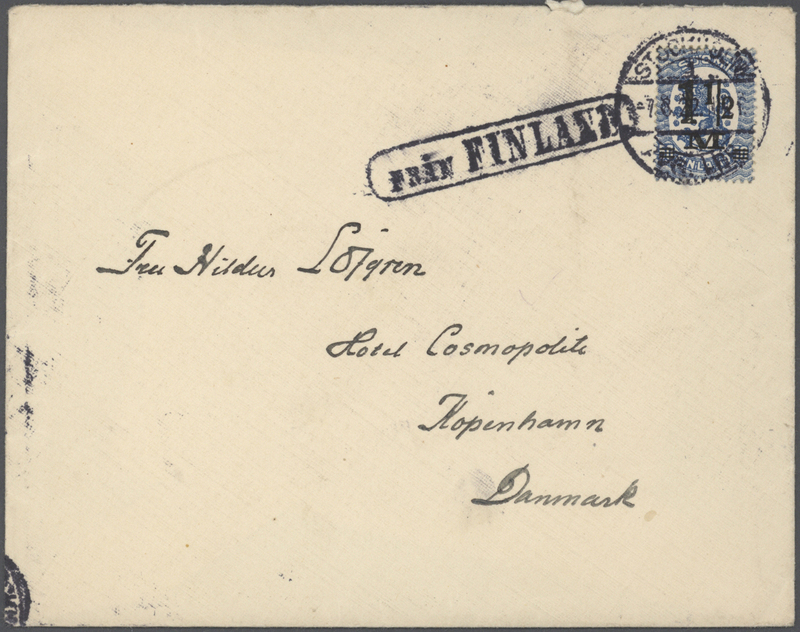 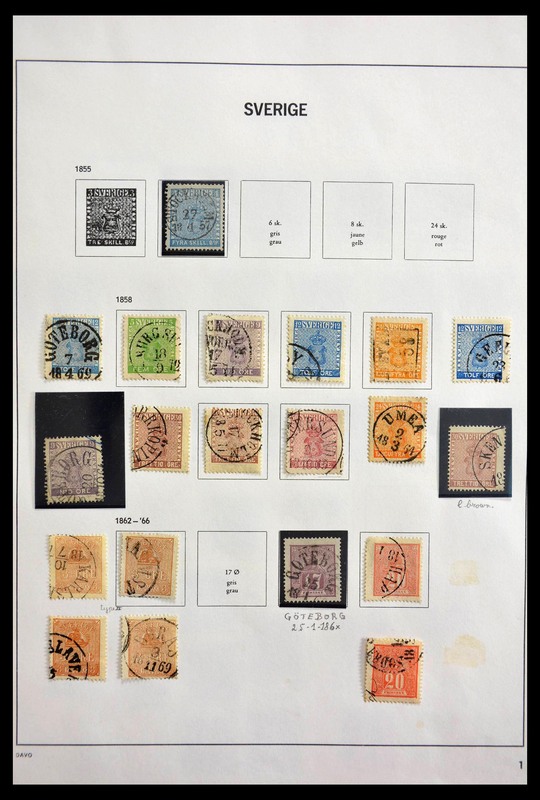 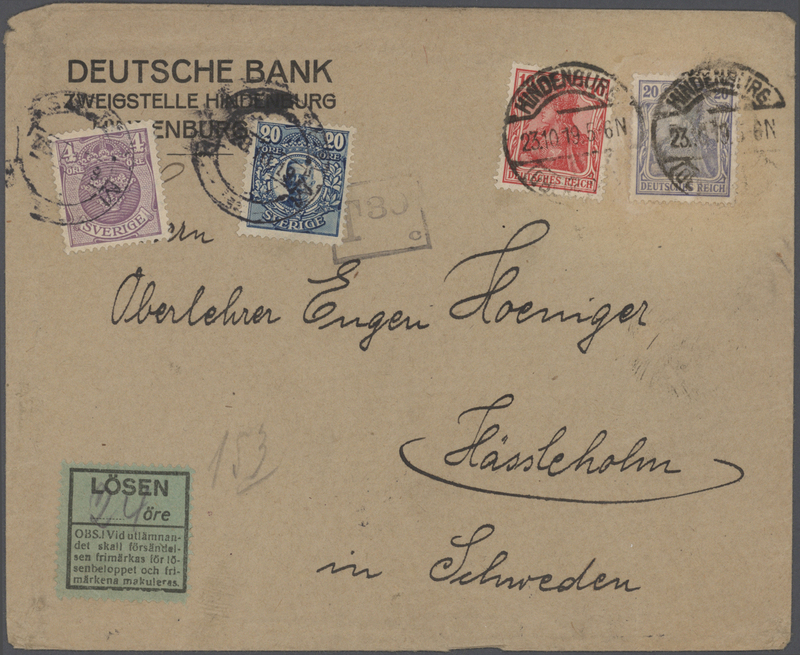 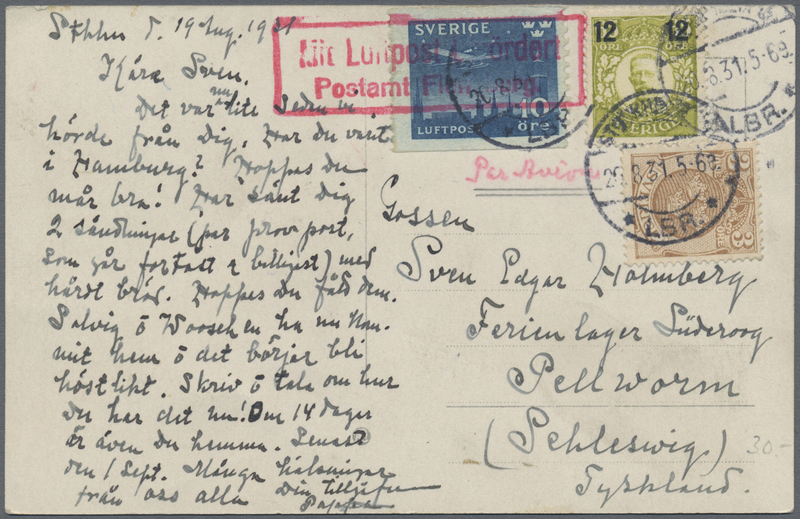 : Several hundred stamps on stock pages, almost all used, with a lot of nice cancellations, colour shades, various papers and perforations, multiples, Officials etc., plus an early Norwegian postal stationery picture postcard sent uprated to Germany from Lærdal in 1894. 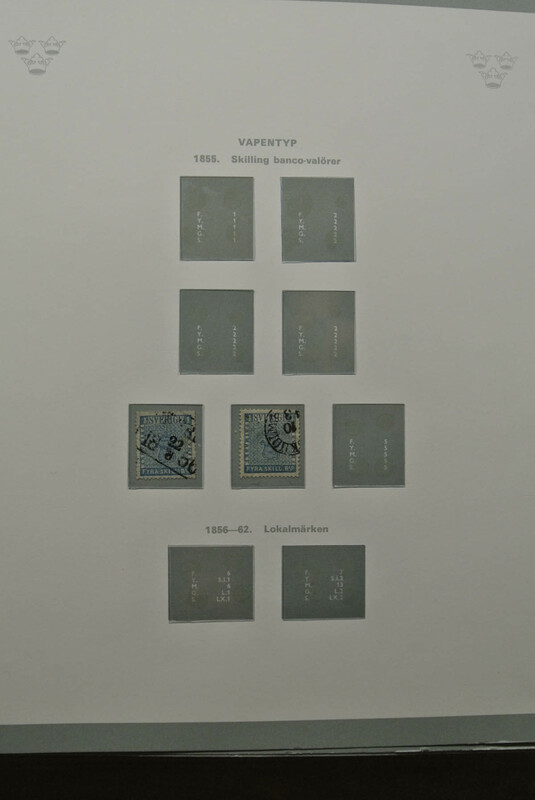 36631 gestempelt (marked) 1860-1980, zumeist gestempelte Partie mit Teilsammlungen und Dubletten, dabei auch einige bessere und mittlere Ausgaben, dazu E-Buch Spanien und weitere Länder, schöner Grundstock. 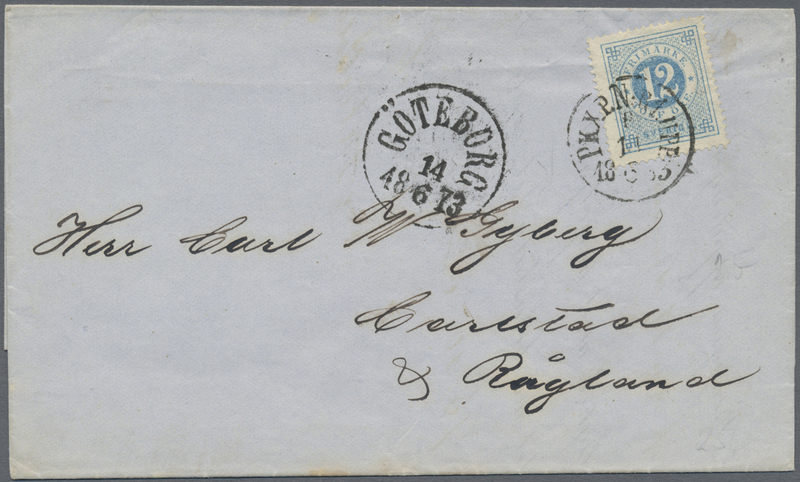 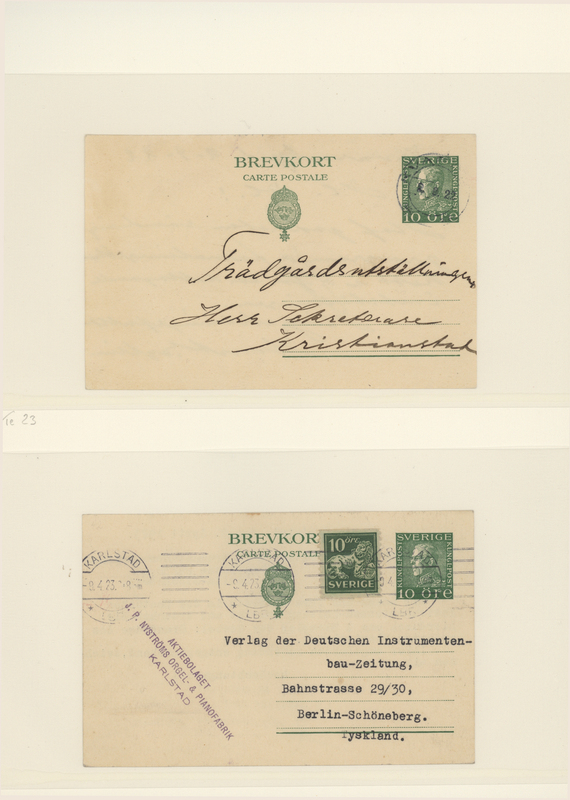 36633 ungebraucht (hinged) * postfrisch (never hinged) ** gestempelt (marked) Brief (cover) Ganzsache (Complete) 1873/1995, Brief-und Markenposten mit einigen interessanten Stempeln bzw. 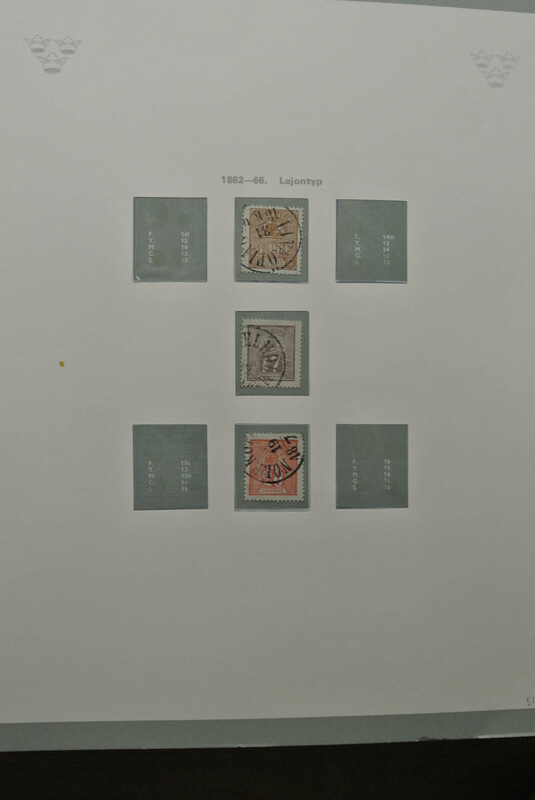 Verwendungen, Auszug siehe Foto. 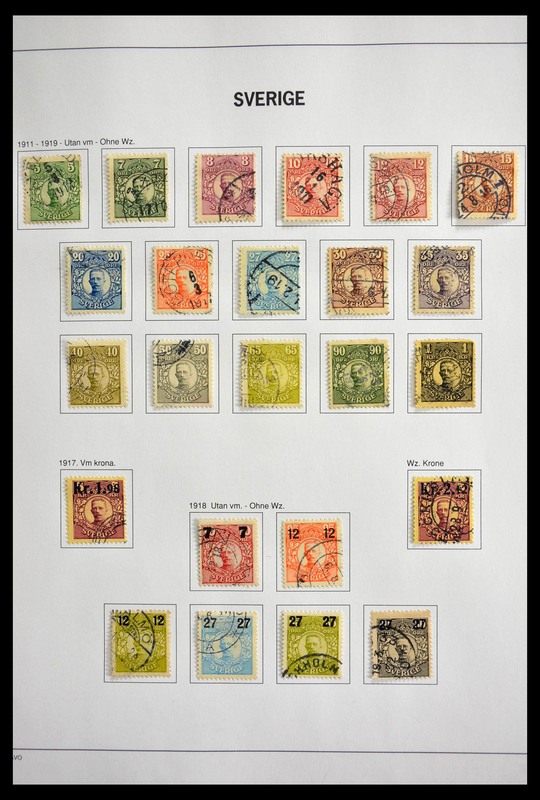 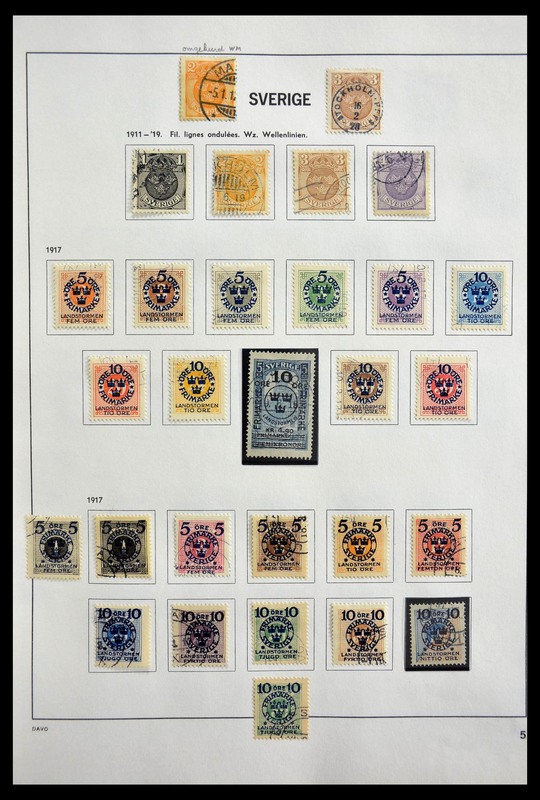 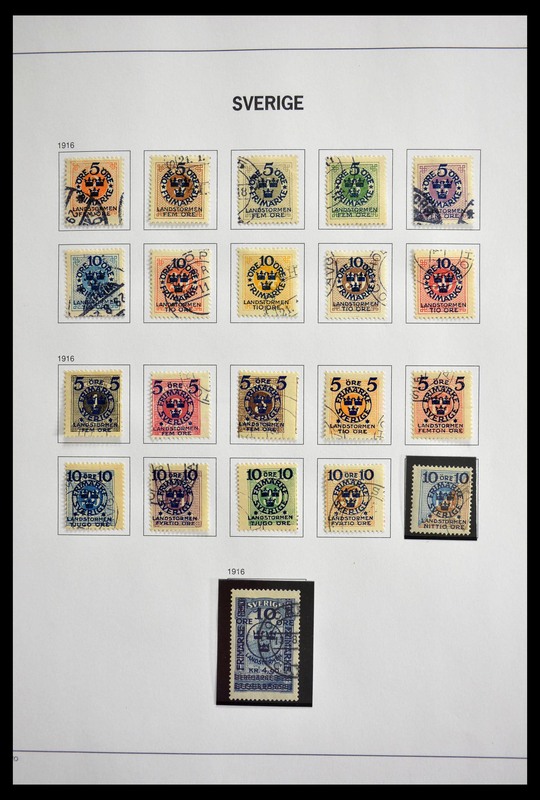 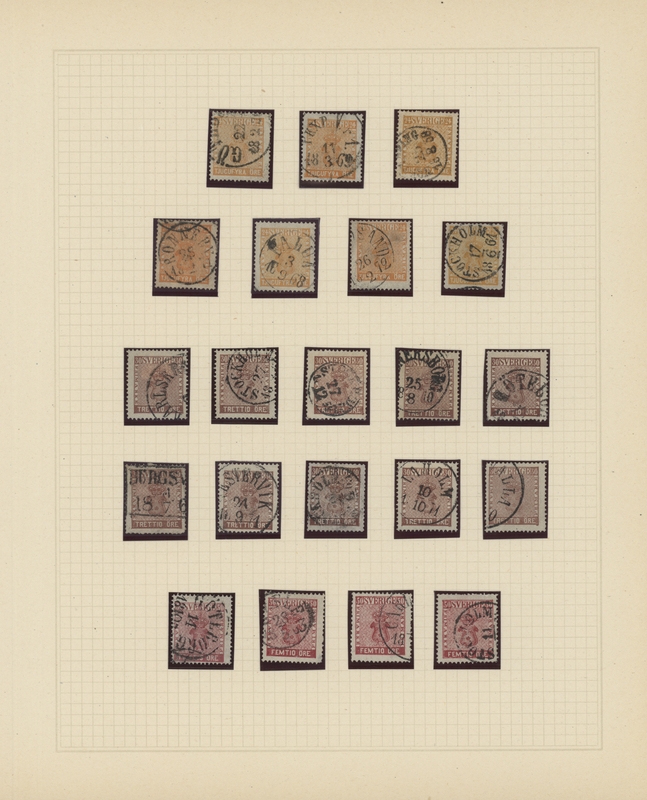 36634 gestempelt (marked) 1875/1930, several hundred classic od semiclassic stamps on stockpages. 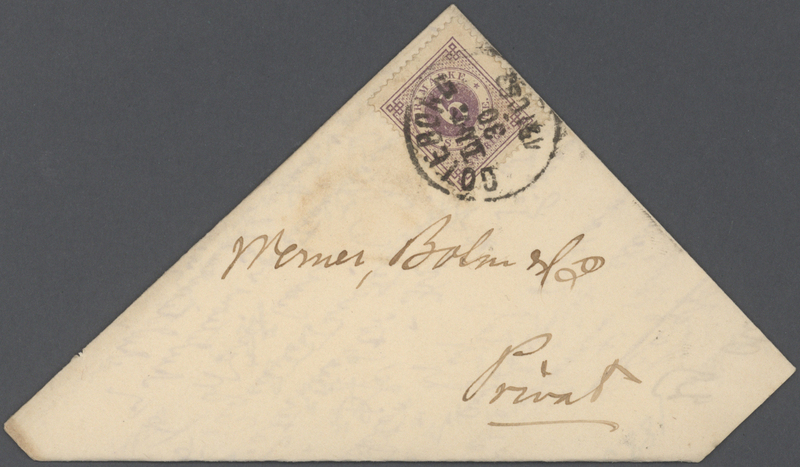 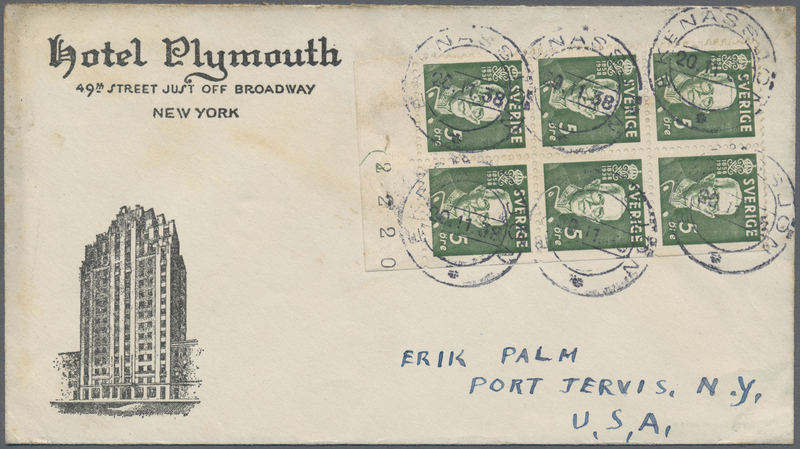 Many fine cancellations maybe treasure trove for postmark collectors. 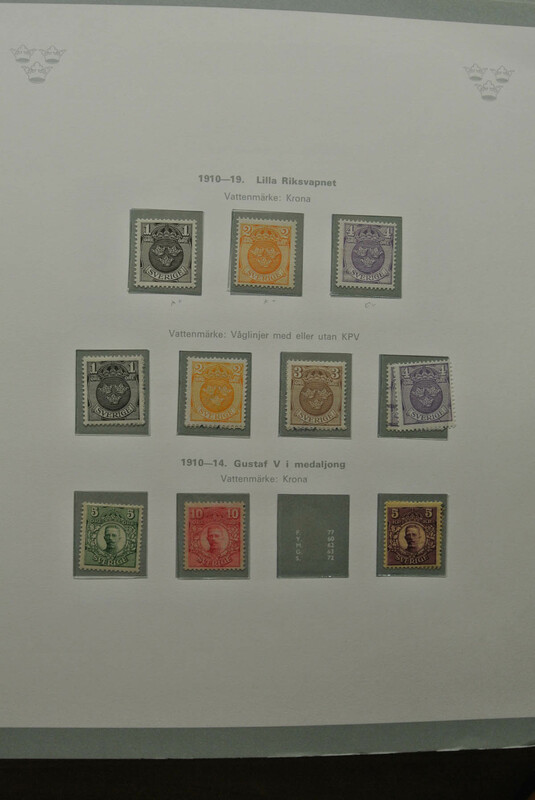 36635 gestempelt (marked) postfrisch (never hinged) ** ungebraucht (hinged) * 1900/2000 (ca. 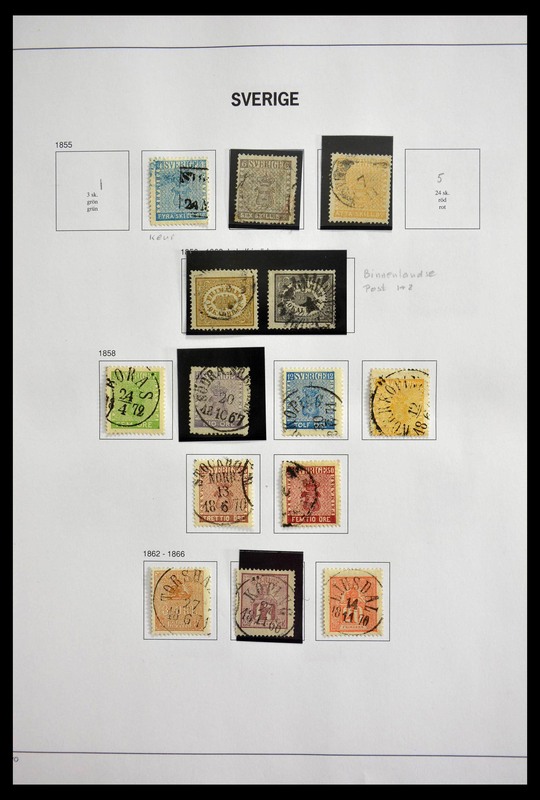 ), comprehensive accumulation in several thick stockbooks with plenty of material, in addition three smaller boxes with loose material incl. 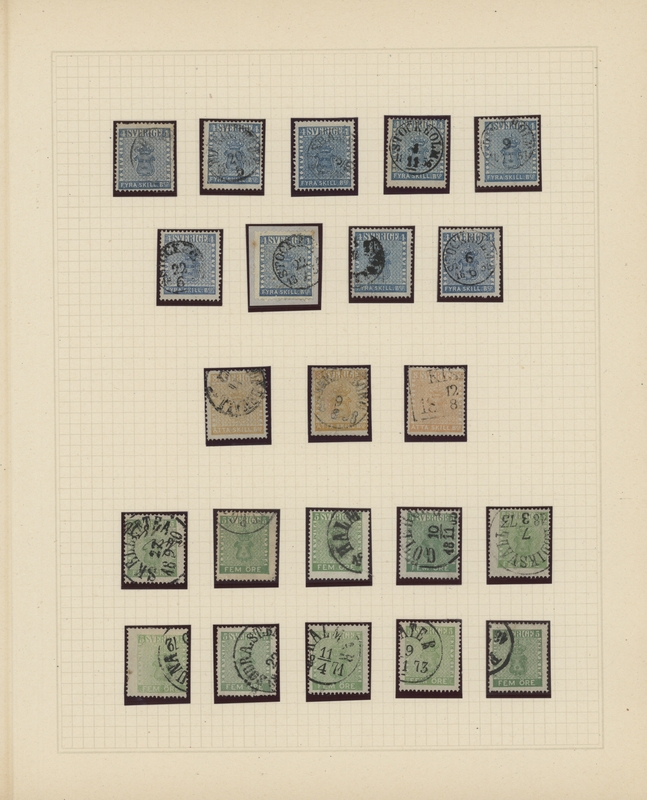 booklets with considerable face value. 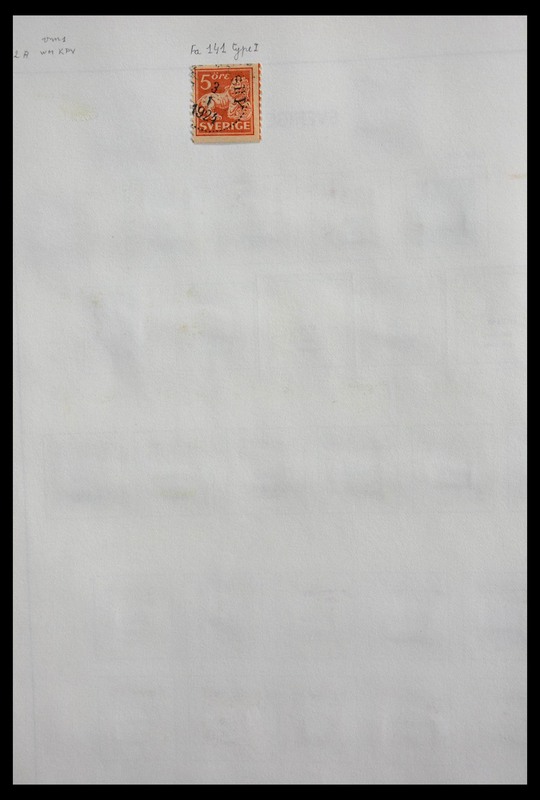 Very high cat.value!